"Pete Johnson is a wickedly funny writer, and it's a welcome change to have first steps in the dating game described from a boy's point of view." Click here ….. to read more. 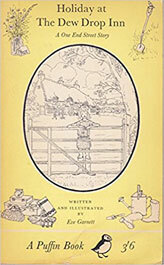 The third in the much-loved Louis the Laugh books. 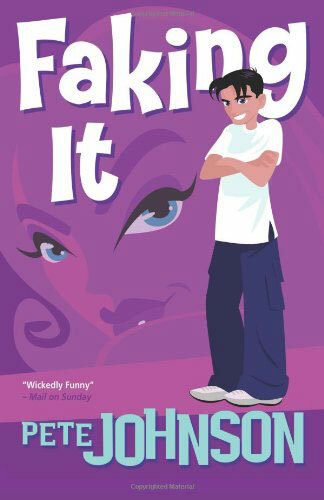 ‘We’d read ‘How to Train Your Parents’ and the other Louis books and weren’t sure what to read next – when my friend recommended this one. 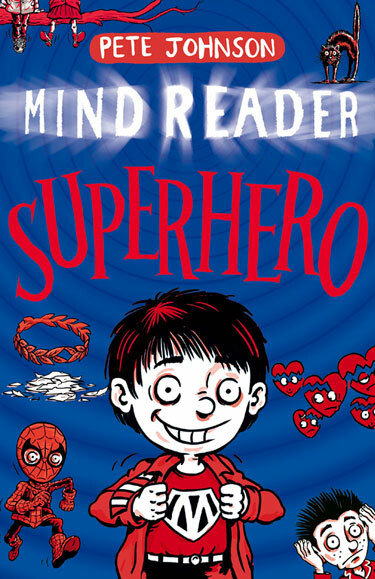 The Sheffield School Library Service, in collaboration with Pete’s publisher, organised a celebration of reading for pleasure on March 22nd, highlighting the MINDREADER books, which have been especially recommended for reluctant readers. The venue for this dynamic event with Pete was the world famous Crucible Theatre. 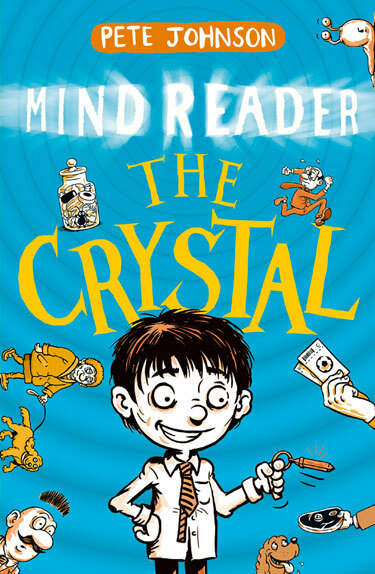 Meet MATT – just an ordinary school boy, until he is left a crystal which enables him to read minds. Suddenly Matt knows what everyone is thinking! The MINDREADER trilogy are comedy adventures with a good helping of fantasy, especially recommended for fans of all the Louis the Laugh books. Matt’s crystal means he can read minds. At first he just fools about with his new super power – but then he has to save a life. Is Matt up to the challenge? Matt has a secret. He is an ordinary boy with a super power. He can read minds. But this time Matt’s powers are put to a real test. He will need to be extremely brave … but he knows he isn’t the least bit brave. So can Matt ever be a true, super hero? To celebrate the Kindle launch, all three MINDREADER books are at a special price. Click the covers to find out more! LOUIS IS A BOY WHO MAKES YOU LAUGH OUT LOUD. Click here to watch this short introduction to the four ‘Brother’ books about Jamie’s Magic Cape. These funny, exciting tales are full of magic and characters who will become your friends . . . In September Pete spoke at The Youth Libraries Group Conference in Manchester on the subject of Funny Fiction and especially his five phenomenally popular LOUIS THE LAUGH books. 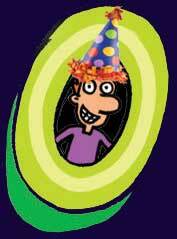 So to celebrate we highlight Pete’s . . .
TOP TEN FUNNIEST TITLES . . .
Louis has just one ambition – to be a comedian. His parents have other ideas! These fun-filled stories also have something to say about life today, as Louis and his parents disagree about everything, from homework to how much time he should spend on on his computer! 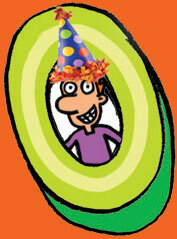 Next to Louis the Laugh, Pete’s most popular character is Spencer, who likes his life exactly as it is. And when he turns thirteen he decides to take a stand and promises he will never turn into a teenager. No, he will stay an ‘Unteenager’ forever! The three MindReader books have just been published in the United Kingdon. FOLLOW THE FUNNY . . . THE CHILDREN’S BOOKS WHICH STILL MAKE ME LAUGH OUT LOUD. This nationwide celebration of books and bookshops returns on October 6th. 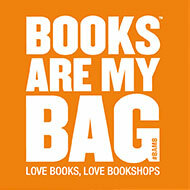 ‘It has got me thinking,’ writes Pete, ‘about some of my favourite bookshops. This beautifully laid out bookshop - on two floors, complete with coffee shop - is a perfect place to browse and look for books. It has a ‘laid back’ yet buzzy vibe with several reading areas. I have worked several times with this bookshop – and they are justly celebrated for brilliantly organised author events. But this bookshop – and the companion one at Gerrards Cross - has some of the most informed staff you could hope to meet, yet wear their knowledge lightly and are also friendly. You really are among friends here. 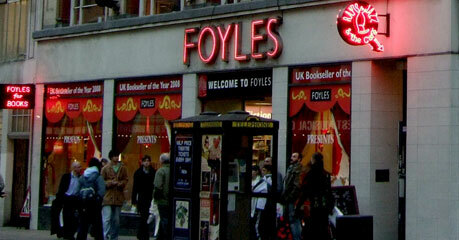 This dazzling bookshop was the one I first visited as a child, with my parents. 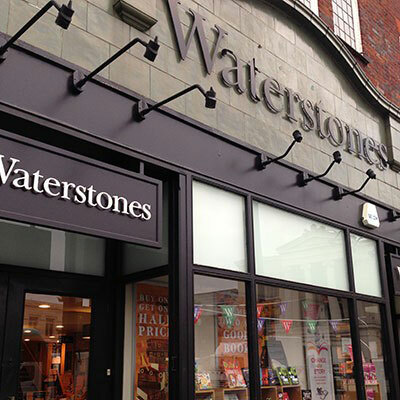 Here was where I came to pick my birthday or Christmas books - as well as over the summer holidays. No wonder it had a wonderful enchanted feel about it. There were books here I could not find anywhere else. Visiting it is still a real treat and I always leave with a bag of books and a deep sigh of contentment. ‘I think I’ve arrived somewhere weird. Started at my new school today I was met by this moth-eaten old geezer who said he was the headmaster. He’s about a hundred and eight, has one huge eyebrow and spits a lot. Had to wipe my face down after he’d gone. I was soaked through. in HOW TO UPDATE YOUR PARENTS. ‘Normally they’d have brought the sales agent in here,’ Maddy hissed. ‘But today they didn’t dare.’ The room looked perfectly normal until a huge gust of whiffiness blasted right through the room. ’Eeer,’ I began. The first time I only saw its face. Out of the darkness it came floating towards me. It had evil, red eyes. Blood poured out of its mouth. It was the ugliest, most horrible thing I had ever seen. And I’d brought it to life. I thought it was only mad scientists in stories who could create monsters. Not ten year old boys like me, Daniel Grant. I’m still not sure. I certainly never meant it to appear at my spooky party. 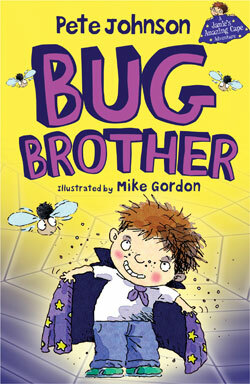 in Jamie’s Magic Cape adventures beginning with BUG BROTHER. What would you do if you were mistaken for a very famous – but mysterious – star. Ben can’t help enjoying it at first, especially when he finds a group of fans outside his house one night . . .
‘You’re on a mouse mat as well, aren’t you?’ said one girl. ‘Yes I am,’ I said with a proud grin. ‘And you painted a picture for charity, didn’t you?’ said another girl. ‘Er two pictures actually,’ I said. I knew more about Ben Moore than his own mum by now. It was sort of fun signing the autographs and listening to them tell me how great I was. But after a while I sent them home. Lara is the school’s biggest rebel and Dominic has hardly ever spoken to her – until one incredible day . . .
‘You;’re walking out of school?’Dominic was shocked. 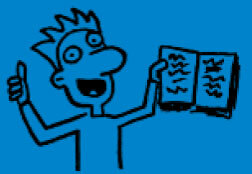 Pete answers your questions about writing funny stories – and gives you some tips too. How hard is it writing something which you hope is funny? First of all I never, ever sit down and think. ‘Right, I’ve got to be hilarious now.’ That would just terrify me. Also, I don’t think of comedy as a genre, in the way horror or detective stories are. It’s more a style, a way of looking at life. So first of all you have to think about plot and your characters. That always comes first. Do you worry about your stories being funny? Oh yes, I’m constantly worried about that. And when I show early drafts to friends, I’m always listening outside the door, hoping I can hear them chuckling! But the comedy has to flow out of situations and characters. It can’t just be added on. That always feels phoney. Do you hear your comic characters in your head? Great question and yes I do. I believe the voice of your characters is especially important in funny stories. What’s the best part of writing a comedy? Normally when I’m writing a story it’s rather like trying to talk on the phone on a train, where you keep losing the signal. So I might write a couple of lines, and then stop and think for a bit … and then maybe write another line. But occasionally the character just takes over and talks away for pages and pages. I don’t feel as if I’m doing much at all, except scribbling down everything which my character tells me. It’s magical, exciting, mysterious. Those days are very rare though. Do you have days when you don’t feel at all funny? Most days. A couple of tips – sometimes a warm-up can help. So don’t start writing right away, maybe copy down a paragraph from your favourite funny book. I often do this and it always relaxes me and often frees up my imagination – and humour. The famous writer, Ernest Hemingway also had a suggestion. Before you finish one day – write down the first line you will need to get you started tomorrow. So next day there it is waiting for you. And you’ve begun without any worry at all. Do you have favourite funny books which inspire you? There are so many, I collected all Richmal Crompton’s ‘Just William’ books and Anthony Buckeridge’s ‘Jennings’ stories too. I loved Roald Dahl of course, but also Edward Eager, who wrote highly ingenious, witty fantasies such as, ‘Half Magic’ and ‘Seven Day Magic.’ Later I became a huge fan of Sue Townsend’s peerless Adrian Mole books. I also really like books like ‘Holiday at the Dew Drop Inn’ by Eve Garnett which is not exactly a comedy and yet she seizes the humour in every one of her characters and situations. 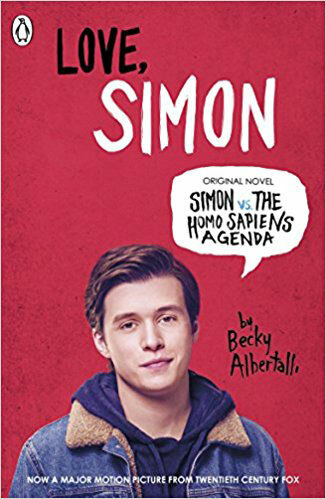 I admire too, a book I read recently, ‘Love Simon.’ by Becky Albertalli. This manages to be both heartbreaking and hilarious... I could go on and on. 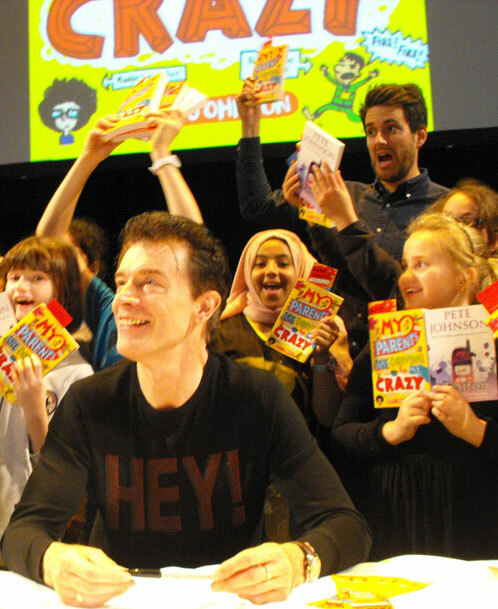 Have you got any tips for young, aspiring comic authors? Yes, don’t be put off by your first drafts. The book in your head can seem brilliant, then when you put it down on paper it appears so flat and dull and disappointing. That happens to me all the time. My first drafts are almost always very, very bad. You have to push past that and keep going. Don’t be afraid to cut too. It’s vital for all stories but especially funny ones. Flabby, over-written scenes can ruin your comic rhythm. And finally, you have to write from your heart. Find characters and themes you really care about. The humour will follow. P.S. Writing is really just imagining and pretending. So never be afraid of it. Or think you can’t do it. Just relax and have fun. And my niece Zoe, for asking me so many interesting questions. It was a pleasure to answer them. What goes? tick, tick, woof, woof? What did the wig say when it was blowing across the street? What did his parents say to the boy ghost? Spook when you’re spoken to. Why did the scout feel dizzy? Because he did so many good turns. But the next day the policeman stops the car again and there are the three penguins again, only this time one of them is wearing sunglasses. ‘I thought I told you to take those penguins to the Zoo,’ said the policeman. What does a monster eat after he’s had his teeth out? What is the fastest part of a car? What do you call a Gangsta Snowman? Which King had a noisy bottom? What type of boats do vampires use? AND ‘TWO’ EXTRA JOKES ESPECIALLY FOR YOU. Which game do monsters love best? What do you call a monster who never blows his nose? 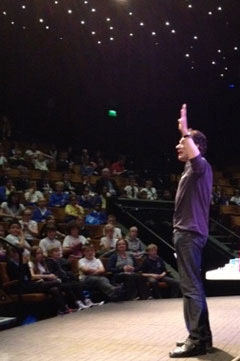 Pete gives you the low-down on how he can inspire the pupils at YOUR school. Click here to read more . . . and if you would like Pete to visit your school. Clare Tandara, Little Green Junior School, Herts. 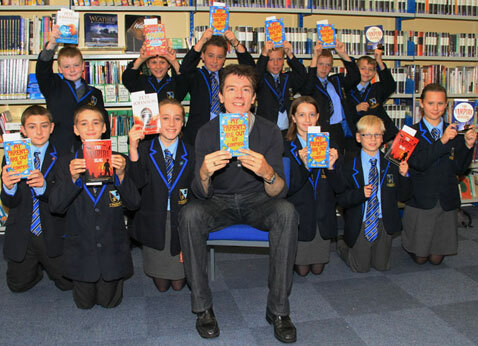 If you would like Pete to visit your school or library, please click here. 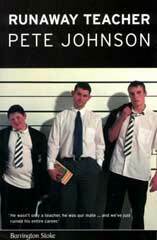 THE TOP FIVE FAVOURITE PETE JOHNSON BOOKS ARE . . . Discussion topics: Helicopter parents. Pushy parents. When your parents don’t understand your ambitions and dreams. Pressure at school. Comedy, International Best Seller, shortlisted for the Roald Dahl Funny Prize. Discussion topics: Parents trying to be young again. Generation gap. Discussion Topics: Being victimised and bullied. Should you stand up for yourself? Friendship. Trusting other people. Peer pressure. Click here for detailed Book Club notes. Discussion topics: Light-hearted and accessible but with deeper themes of honestly, personal responsibility and self confidence. Discussion Topics: When your mum or dad separate. Communication problems between parents and children. ‘THE GHOST DOG’ was the first ever book to win THE STOCKTON CHILDREN’S BOOK OF THE YEAR AWARD. 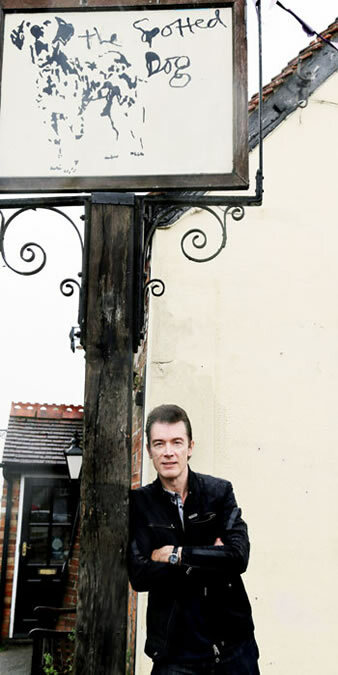 Now, twenty years later PETE returned to STOCKTON on Saturday 24th March to CELEBRATE TWENTY YEARS OF THIS TOP AWARD and talk about ‘THE GHOST DOG’ and ‘THE CREEPER’ – which also won THE STOCKTON CHILDREN’S BOOK AWARD. PETE IS THE ONLY AUTHOR TO HAVE WON THIS AWARD TWICE. 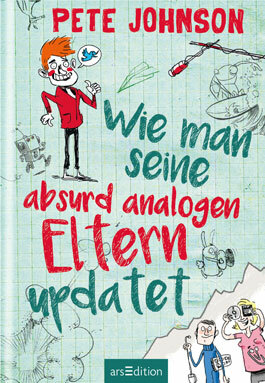 Last year ‘HOW TO UPDATE YOUR PARENTS’ made so many pupils laugh, in Germany, that leading German publisher arsEditionannounced it was one of their best sellers. My voice rose, my face reddened, I had rarely felt so angry. 'We think you are being extremely unfair to all children - and Enid Blyton,' I announced, then I turned to my equally furious mate, David, who nodded in solidarity. We were both nine years old and normally very quiet and shy. But today we were outraged that Enid Blyton - the author whose books reigned over our lives - had been banned (for reasons we never fathomed) from the publc library. The senior librarian, to whom we were protesting, was unmoved - even when we threatened the ultimate sanction - if Blyton continued to be absent from this library then we would absent ourselves too. So we switched to a far less convenient but Blyton friendly library three miles away. In childhood we give to our favourite books and authors something extremely special - unconditional enthusiasm. And when even our tastes clash - 'Sweet Valley High,' and all pony books remain forever unexplored by me - she writes with such warmth, understanding and crackling wit that I enjoyed discovering what she gained from them. 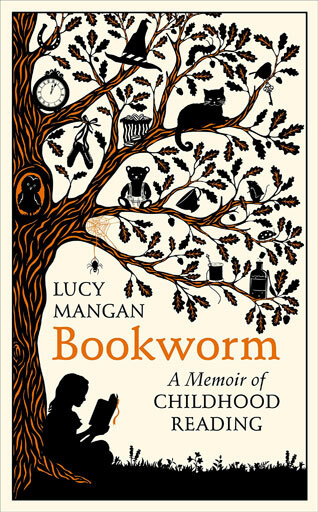 'Bookworm' is so good I even forgive her some terrible omnissions - a whole section on school stories for instance, without even a reference to Jennings. Shocking. The strangest thing about Louis is, originally he wasn’t supposed to be in ‘HOW TO TRAIN YOUR PARENTS’ at all – or ‘The Trouble with Parents,’ as I called it first. Louis and I met after I’d written the opening thirty pages of ‘The Trouble with Parents.’ I read those pages with such a sinking heart. I was certain there was a good idea here – children suffering from what they called ‘parent fatigue,’ but none of the characters jumped off the page. They were shadowy and vague and I just couldn’t make them talk. I thought and thought about how I could bring them alive. But I found myself at a dead end until in my head I spotted a newcomer. He just appeared out of nowhere. A boy with jug ears grinning away at me with such a wide smile it took over his whole face. I liked him instantly and I knew him instantly. He was the class clown, never wanting to be serious about anything – and yet unexpectedly very determined about one thing – making his dream of being a comedian come true. Soon I was listening to Louis bantering away with his parents. He was so funny and you know what? I didn’t seem to be doing anything, I was only eavesdropping. Next day I ‘overheard’ Louis talking to someone else – Maddy. The twelve year old who becomes his agent and also teaches him the four secrets of parent training. They were magic together. A brilliant team. I knew now what I had to do next. It became my first ever-international best-seller. I went on to write other award-winning comedies. But ‘How to Train your Parents’ outsold them all – and pupils, teachers and librarians kept asking me when was Louis coming back? ‘I don’t do series,’ I replied. And I didn’t, then. For an incredible ten years I resisted all calls to bring Louis back. I wasn’t just being stubborn. I was scared. Everyone loved, ‘How to Train Your Parents’ so much that whatever I wrote next about Louis would never match it – and could only disappoint. But finally Louis the Laugh and I reunited. Once again we hit it off instantly and ‘My Parents Are Out of Control,’ became another best-seller. Three more books narrated by Louis have followed. We are truly old friends now which is just as well as he accompanies me into every school, library and bookshop I visit. Who is Louis really? Can I meet him? Is he like you at all? Did you ever have a friend like Louis? The questions rain down about him. People seem far more curious about him than me! I was even asked once if Louis was on Instagram. He really has taken on a life of his own. And occasionally, I remember that very first meeting with Louis and the way he just popped into in my head. Where on earth had he come from? And did I find him or did he find me? Honestly, I don’t know. But huge thanks for sixteen fabulous years in print. COMING SOON: LOUIS THE LAUGH’S FAVOURITE JOKES AND . . . 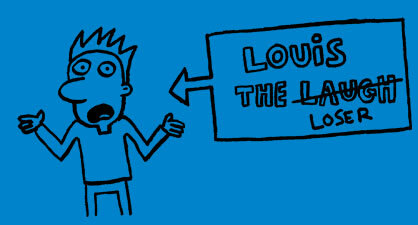 THE GREAT LOUIS THE LAUGH QUIZ! 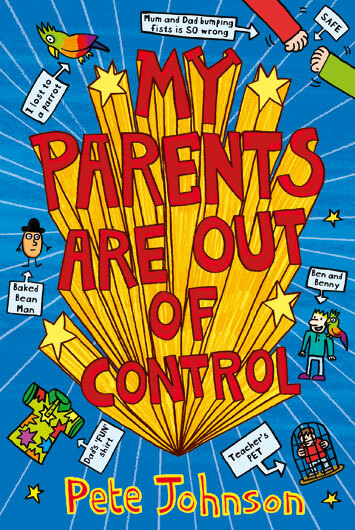 SAVE £1.92 ON THE MUCH-LOVED COMEDY FAVOURITE, ‘MY PARENTS ARE OUT OF CONTROL’ – BUY IT FOR ONLY £5.07 ON EDUCATION UMBRELLA. Click here for more details! He gives lively, interactive talks and is happy with large groups. Pete is best known for being a gripping story-teller. He reads extracts from his books . . .
. . . and promotes reading for pleasure. With special thanks to the brilliant Lockers Park School. WHAT WOULD YOU DO IF YOUR DAD TURNED UP OUTSIDE YOUR SCHOOL DRESSED AS A GANGSTER RAPPER? Panic! Change your name? Leave the country? And that’s just the start of Louis the Laugh’s problems with his parents when they decide they want to be COOL again. Louis has to put a stop to this before his own reputation is destroyed – but how? FIND OUT IN THE ‘LAUGH OUT LOUD,’ MUCH LOVED ‘MY PARENTS ARE OUT OF CONTROL.’ Now being celebrated in special promotions on AMAZON and WORDERY. 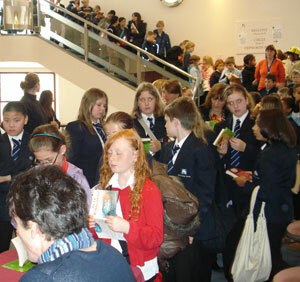 The Stockton Children’s Book of the Year Award is a popular prize and a high profile literacy event for children. Now twenty years later Pete will be returning to Stockton on Saturday on Saturday 24th March 2018 for a special day to celebrate all the fantastic winners – and the thousands of children who have been involved with this award. I like to think I’m a fairly tolerant person (lazy might be a better word) but just occasionally something happens which impels me to speak up. Don’t worry, I’m not burbling on about Brexit. 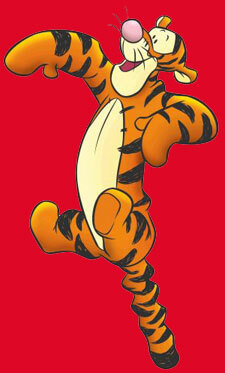 I want to talk about something much more important – Winnie the Pooh. Here I must admit a personal failing – all these years I have been so busy laughing and generally enjoying myself as Pooh and friends try to trap a Heffalump, look for the North Pole and play Poohsticks. I haven’t once considered whether these books were also filling me with a moral purpose. To have created characters which have lived so vividly for ninety years they have become archetypes – isn’t that an achievement? But it doesn’t help us with this demand of Philip Pullman – that children’s books must move the reader on from childhood. 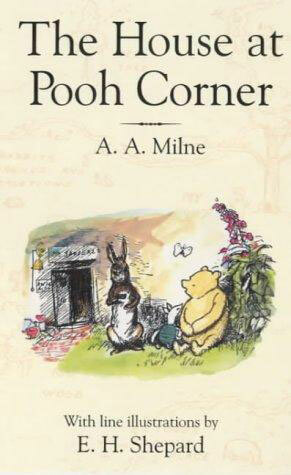 Except – there is that poignant last chapter of ‘The House at Pooh Corner. Remember when we find out (or Owl does) that Christopher Robin is leaving the Forest in the morning to BE EDUCATED into ‘how you make a suction pump and what comes from Brazil.’ And Christopher Robin tells Pooh that although what he likes doing best in the world is Nothing, from now on he is not going to be doing Nothing anymore, Isn’t this a sign that he was leaving childhood behind and Pooh was moving into the shadows? What a relief! I’ve found a way to justify reading Winnie the Pooh even in these austere times. Of course the book does end with the words, ‘It wasn’t really Goodbye because the Forest will always be there … and everybody who is Friendly with Bears can find it.’ So we’ve moved on from childhood and yet a part of us is forever captured by those days. ‘But children want to grow up,’ barks Philip Pullman. And he’s right – sometimes they do. And wrong – sometimes they don’t. Well that’s my experience. Certainly I was very torn (still am) But Mr Pullman would probably say I’ve spent too much time in the Hundred Acre Wood. 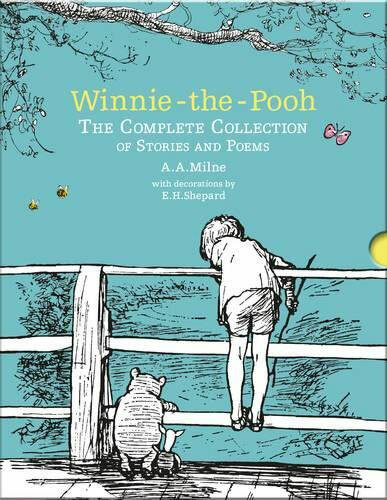 Anyway, I believe that the Winnie the Pooh stories – created in affectionate partnership and presented with immense skill and sympathy by E. H. Shepherd – retain a secure place in children’s literature. Did I mention they are still very, very funny? I did. Well then I think I’ve said everything. Spencer quote: ‘If ever I have a girlfriend I’ll meet her in town for just one hour a week. Maybe on her birthday I might take her to McDonald’s as well. The boy who girls really like but only as a friend – in the top teen title. Will quote: ‘Ruth is the first girl I ever kissed. She was a Munchken at the time. So was I. Even then I realised this was a significant moment in my life. That’s why I removed the brace from my teeth first. Afterwards she said I was just so nice. THE TRULY DISGUSTING SCENE WHEN A PIECE OF CAKE FLIES OUT OF THE HEADMASTER’S MOUTH AND STRAIGHT ON TO LOUIS’S TONGUE. WHEN LOUIS’S DAD TURNS UP OUTSIDE HIS SCHOOL DRESSED UP AS A GANGSTER RAPPER. WHEN LOUIS THROWS UP OVER TV HOST, MICKEY BOYD. With huge thanks for all your votes. ‘I absolutely loved HOW TO FOOL YOUR PARENTS. This one was so funny.’ Nayu’s Reading Corner. ‘Fabulous, so funny, couldn’t put HOW TO FOOL YOUR PARENTS down. 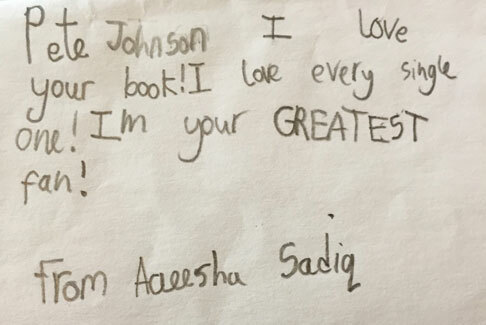 I have read it several times now.’ Miss Messy, Aged 11, Toppsta. LOUIS THE LAUGH GOES GLOBAL . . . Above: some of the many faces of How To Train Your Parents. Below right: the book in Spanish. Last week Pete signed the Slovakian contract for ‘How to Train Your Parents.’ Exciting in itself but it also reflects a significant milestone, as this book will soon be translated into an amazing thirty languages. Pete has written three more best selling books about Louis. Most recently the acclaimed and much talked about ‘’HOW TO UPDATE YOUR PARENTS.’ A new Louis book ‘HOW TO FOOL YOUR PARENTS’ will be published later this year. Click here to read Pete’s diary from the week he lived without the Internet. DO CHILDREN REALLY NEED A DIGITAL DETOX? Click here … to read Pete’s account of a remarkable friendship on the Guardian Books website. WOULD YOU LIKE PETE TO VISIT YOUR SCHOOL OR LIBRARY? Above: Greatest fan! Pete's been sent this message following his visit to Godolphin Junior Academy, Slough, one of the many school visits he made before, during and after World Book Day. 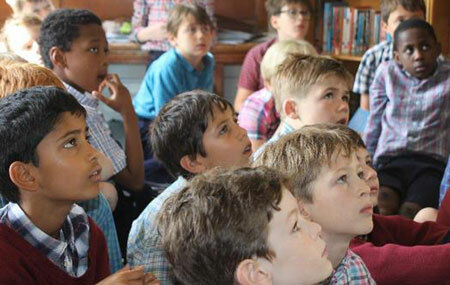 RECENT HIGHLIGHTS . . .
. . . include a super World Book Day spent at Portland Place School, London, with Daunt Books. And two brilliant days spent with Chorleywood and Gerrards Cross Bookshops. When all of a sudden Mum and Dad start acting suspiciously nice Joe knows something is up. Then he discovers the shocking truth. Mum is chucking his Dad out. Joe and his sister Claire want life to return to how it used to be – when Mum would explode with laughter at Dad’s jokes. But they have to act fast, especially as Dad’s appearance is deteriorating and he needs urgent training to overcome his many bad habits. To make matters worse, the slimy Roger is sniffing around Mum. Pete says, ‘Rescuing Dad was my first ever comedy and has a special place in my affections. I think fans of my Louis the Laugh books will also really enjoy this book too. 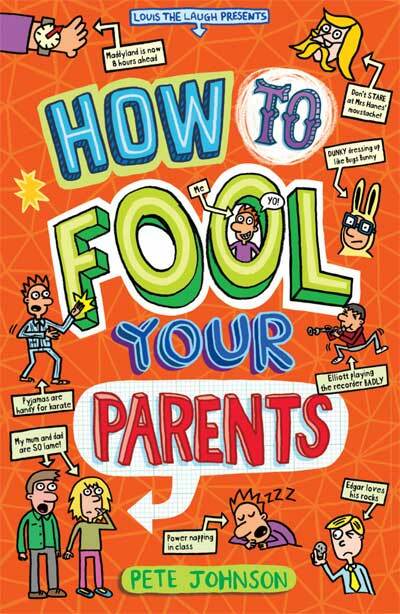 NEW FOR 2017: ‘HOW TO FOOL YOUR PARENTS’ LOUIS IS BACK IN ANOTHER LAUGHTER-FILLED TALE. MORE DETAILS HERE SOON! 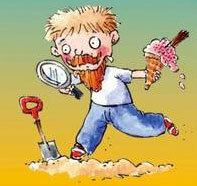 This year Pete will be visiting Portland Place School in London. The day before he’s in Leicester at Judgemeadow Community College. Then he will be spending two days with the brilliant Chorleywood Bookshop, this will be followed by visiting Prior Park College in Bath … In other words, Pete is really busy in March – just how he likes it. A love story which will also make you laugh a lot. MEET WILL – 15 years old and with plenty of friends who are girls but no girlfriend. January is the longest month of the year. It is always January 19th for at least two weeks. And don’t believe people who tell you February lasts for only twenty-eight days. We all know it lingers on for far longer than that. But fear not. I have some books to get you through the ‘bleak mid winter,’ certain to lift spirits and transport you far away. I so love that. William employing his own window mender. He is brilliant company and a richer character than you might remember.The stories are perfect farces – often beautifully judged comedies of misunderstanding. Particularly hilarious examples in this book are THE HIDDEN TREASURE and WILLIAM AND THE SCHOOL REPORT. What of modern children’s books? 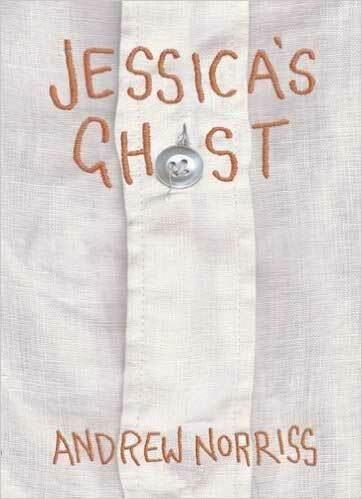 One recently enjoyed was ‘JESSICA’S GHOST by Andrew Norris (David Fickling Books) This is a book you just cannot put down. Francis is a loner, but then one day on his own in the playground as usual, he meets a girl, Jessica who claims no one else can see her, as she is dead. She can’t remember how she died. She just found herself at the hospital one evening dead, where nobody could see or hear her until now. I love the humour – and warmth – Andrew Norris brings to this fascinating story, full of surprises. Half way through the book we discover just why Jessica died and the story takes a darker turn, but in a very sure-footed way. And the ending is positively inspiring. Last summer I was one of 200 people at a special conference at the British Library – ‘Bodies in the Library’ – celebrating the big revival of interest in Golden Age crime stories. Of course when we say Golden Age, the first – and in some cases last – name which people think of is Agatha Christie. Yet, superb as she is there are other wonderful names. 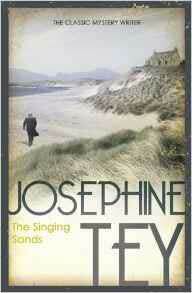 Two of my favourites are Cyrl Hare and Josephine Tey. Neither wrote very many crime novels (Hare, nine books, Tey, eight) and both died far too young (in their 50s) But their books are well worth seeking out, as they both celebrate The Golden Age style and yet move it forward too. 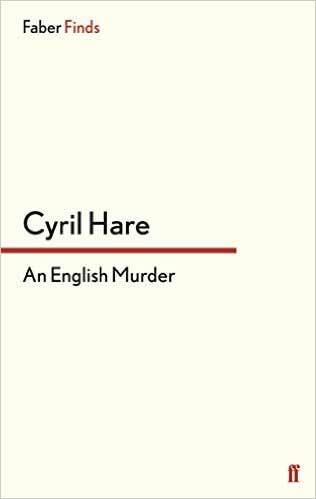 So, Cyril Hare’s AN ENGLISH MURDER,’ (Faber) is set in an English country house, with guests arriving in the drawing room for the festive season and looking forward to tea and plum cake, while outside the snow falls on a hushed world … Perfect. And, of course , the guests are out of sympathy with each other, though in this case – very unusually – the conflict is political. So the characters include The Chancellor of a Labour government, the leader of an English fascist organisation and a Jewish historian and concentration camp survivor. There is also Briggs the butler – who apart from Jeeves is my favourite ever butler in a story. It is the characterisation – as well as the wonderful wry humour, which sets ‘An English Murder’ apart. Josephine Tey’s characters are also one of her strengths. Alan Grant, is a detective who appears in several of Tey’s books, including her last, ‘THE SINGING SANDS,’ (Hodder) published posthumously. Grant is a quiet, polished understated policeman – pure Golden Age, but again there are surprises. As here, he is planning a quiet holiday with an old school friend to recover from a nervous breakdown. Grant’s jangling nerves and mental fatigue are described so vividly we really feel we are there with him. But on the night train to Scotland, Grant stumbles upon a dead man but when the details about the man come out they seem all wrong and Grant is steadily drawn into the case – and the strange message the man had left behind. This is a book I re-read every single winter and if I were stranded on a desert island with only eight books this would be one of them. Tey’s magical prose never fails to delight me. Long after I’ve read it the characters live and indeed grow in my mind. And each time I re-read it I am reminded of the very special power of books to totally transport me away. It was the worst time of my life. Without consulting me, my family had moved house. I hated my new school and my fellow pupils weren’t too keen on me either. I was as miserable as any twelve-year-old boy could be – except when I was in the school library. It was my refuge, a place of safety and sanity and a gateway to so many other worlds. I read everything. Some books have remained a part of me ever since. 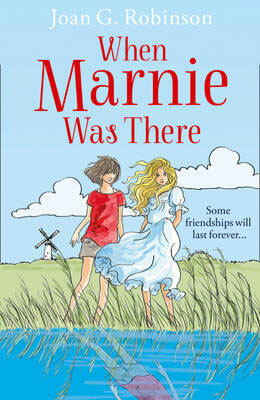 For instance, ‘When Marnie was There’ by Joan G Robinson and ‘Tom’s Midnight Garden,’ by Philippa Pearce. Other times, books that were mine just for a season, like all ‘the Alfred Hitchcock and the Three Investigators’ tales. But with the aid of a wonderful and totally uncritical School Librarian I got through a horrible phase until finally I was ready to start adapting to my new surroundings. Today I am lucky enough to be invited to many schools and their buzzy and welcoming libraries. In the past few days, for instance, I felt instantly at home at the library at Edgbarrow School, in Crowthorne and Colonel Frank Seely School in Nottingham. But much more importantly, so did many of the children. Indeed, School libraries are far more exciting places now, than ever. 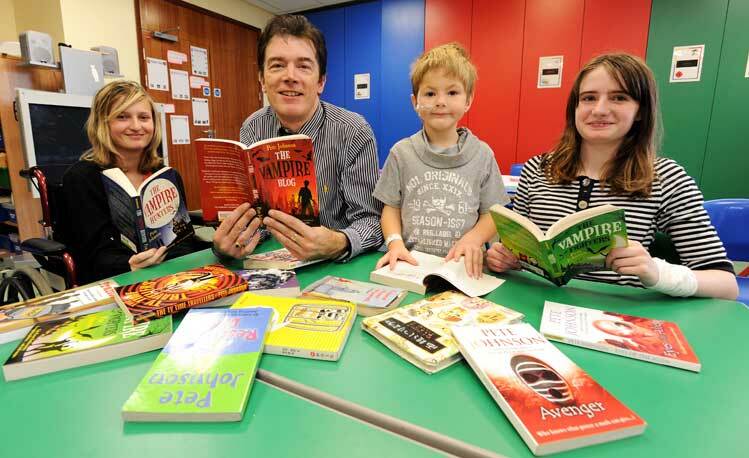 They are part of the modern world – offering access to the Internet – as well as building on the social side of reading, with popular book groups now regularly springing up. Yet, at the centre remains reading for pleasure. Here is when you use your imagination to create a world with the author. And you build empathy too, even returning to your life slightly changed. Meanwhile, school librarians are regularly being asked to justify their jobs, (they are, of course, paid peanuts, as it is) and explain why volunteers couldn’t just replace them. To de-skill and under-resource school libraries is the surest way to destroy them. So let’s resist all attempts to downplay their value, or portray them as an irrelevance in today’s digital world. Librarians are already leading the fight back, by carefully explaining exactly what they do. Often head teachers are astounded when they see what their librarians are contributing to school life. But, of course, not everything they help to bring about can be itemised or measured. The gifts of dreaming and imagination, of finding a writer who you’ve never met and who might not even be alive, but who speaks directly to you, of discovering a book you actually live in - and don’t ever want to put down . . .
School libraries are not only special places but for some children, vital ones, whose absence will make their lives immeasurably poorer. Let’s make sure we never lose such a precious resource. ‘This is a hilarious story of dead fish, gorillas with bananas in their ears, poetry, cunning plans and highly legal documents (kind of) Oh and iPads, iPhones and vlogging, of course. 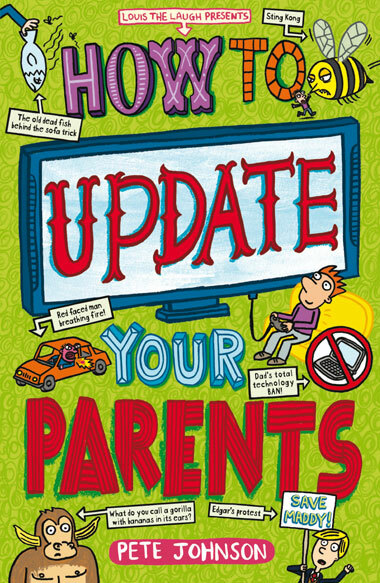 ‘HOW TO UPDATE YOUR PARENTS’ is a rip-roaringly hilarious adventure, a brilliant sequel to ‘My Parents Are Driving me Crazy,’ and features tears, bucket loads of snot and some very strange clothes. It also features jokes of this kind of quality. What does a unicorn call his father? 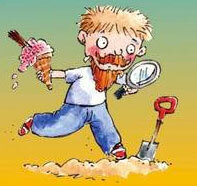 Jake Hope – freelance reviewer who has judged all the top awards in children’s fiction. How would you like to make up a brilliant new identity for yourself? 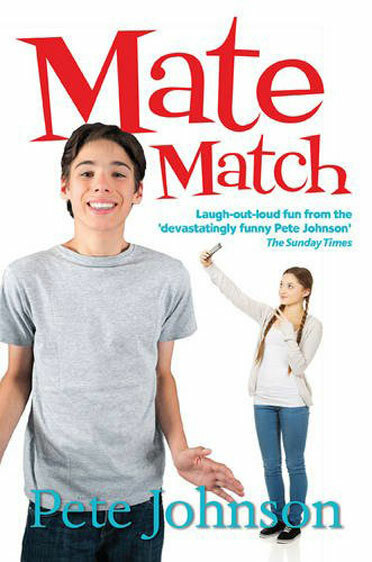 He has never been ‘cool’ or hot until he joins a new dating app called, ‘Mate Match.’ With the help of his sister he turns himself into someone really hot. And then Joe gets a date with the stunning Tania. Hilarious new teen comedy about dating today. 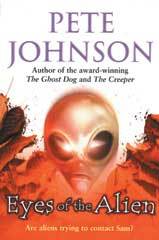 ‘The Ghost Dog’ has never been out of print and has been translated into several languages. Here are some of the comments from 2015 readers at Edwintree. 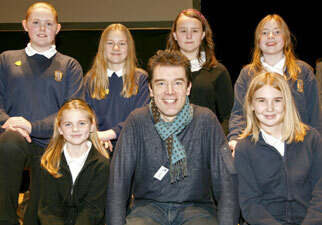 Above and right: Pete with some of the brilliant pupils at St Martin’s School. Click here to read Pete’s diary about the week he went unplugged. In ‘HOW TO UPDATE YOUR PARENTS’ Louis’s parents decide he is spending too much time ‘glued to screens.’ So they come up with ‘their worst idea ever.’ A total ban on tablets, computers and mobiles for a whole week. 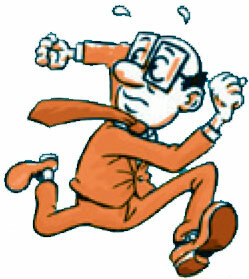 Pete put himself in Louis’s shoes when he undertook his own gadget ban for seven days starting on Monday May 30th. Did Pete survive? Find out on here. 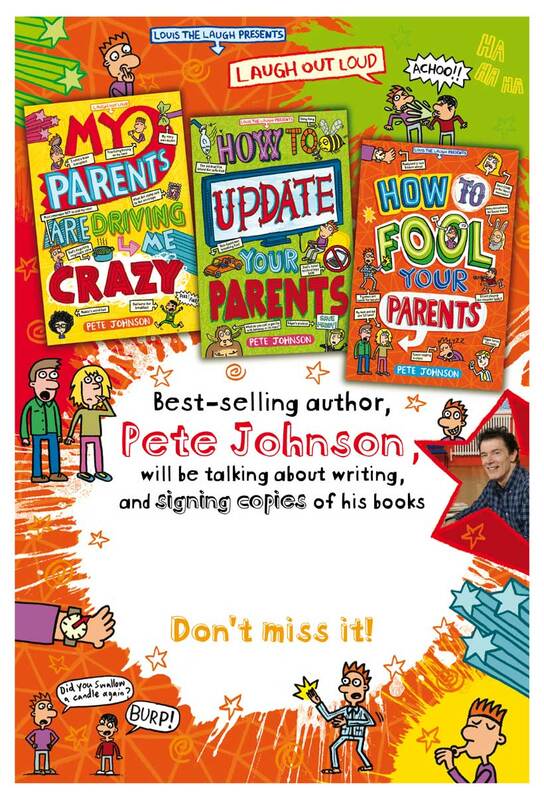 Look out too for Pete’s Unplugged schools tour in June – where he will be encouraging pupils to go gadget free the night before his events and then talk about their experiences. 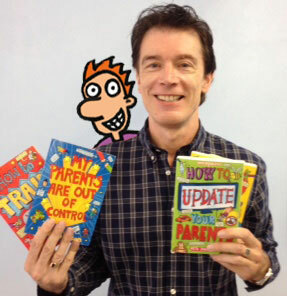 Click here to read an extract from ‘HOW TO UPDATE YOUR PARENTS’, the new book starring Louis the Laugh. 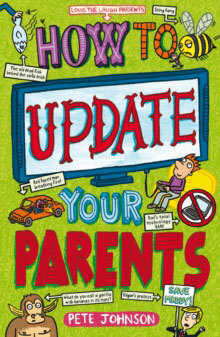 Louis the Laugh has to live without gadgets for a week in ‘HOW TO UPDATE YOUR PARENTS.’ Could you and your family live without any new technology for one day on June 26th? 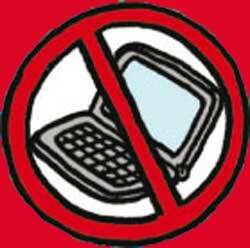 And why not enter the National Unplugging Day Awards? Including SHORT POEM AND ARTWORK competition, judged by Pete himself. …‘It has humour, it has quirky but believable characters and it has just the right amount of eww-factor to really appeal to kids (and big kids like me). 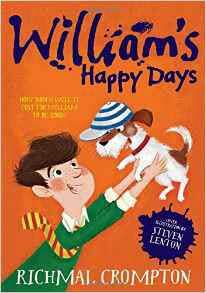 ‘My Parents Are Driving me Crazy is riddled with delicious humour … it’s utterly rib-tickling stuff as we meet Louis, long-suffering star of Pete’s book series. One of Pete’s best-loved and funniest characters, Spencer, the (Un)Teenager, is back in brilliant new editions from Barrington Stoke. PETE’S BEST EVER LAUNCH! EXCLUSIVE … click the book cover below to read Pete’s blog about the launch of ‘MY PARENTS ARE DRIVING ME CRAZY,’ at The Crucible Theatre, Sheffield. PETE’S MOST HOTLY ANTICIPATED BOOK EVER . 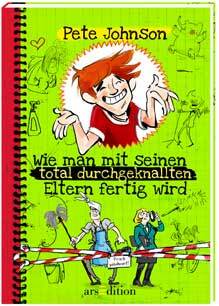 . .
‘HOW TO TRAIN YOUR PARENTS’ and ‘MY PARENTS ARE OUT OF CONTROL’, now translated into 24 languages. The translation rights to ‘My Parents Are Driving Me Crazy’ have already been sold to fifteen countries. 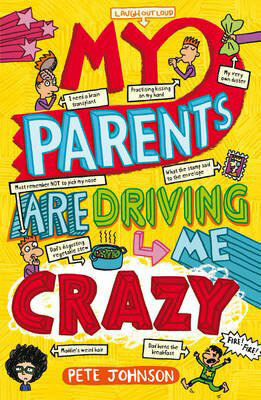 ‘MY PARENTS ARE DRIVING ME CRAZY’ WAS PUBLISHED BY AWARD PUBLICATIONS ON 1ST OCTOBER. THE WHOLE SCHOOL HAS TURNED AGAINST GARETH – AND HIS ONLY FRIEND IS HIS GRANDDAD – WHO ALSO HAPPENS TO BE A GHOST. 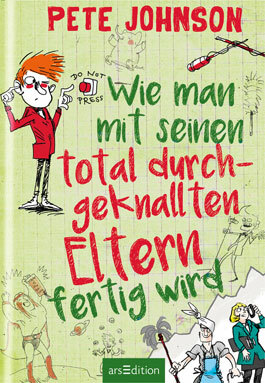 ‘MY PARENTS ARE DRIVING ME CRAZY’ launched in Germany on July 9th and the book’s publisher Ars Edition is ‘absolutely thrilled’ with the initial sales. 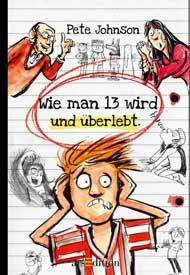 The translation rights to ‘MY PARENTS ARE DRIVING ME CRAZY’ has now been sold to eleven countries. 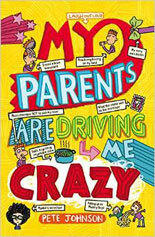 ‘MY PARENTS ARE DRIVING ME CRAZY’ launches in the UK on October 1st. 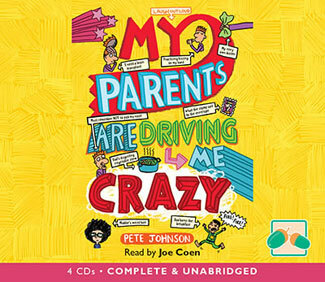 GET 30% OFF ‘MY PARENTS ARE OUT OF CONTROL’ and other great PETE JOHNSON titles at EDUCATION UMBRELLA. Click here for more details . . .
TOP CHOICES FOR READING GROUPS ARE . 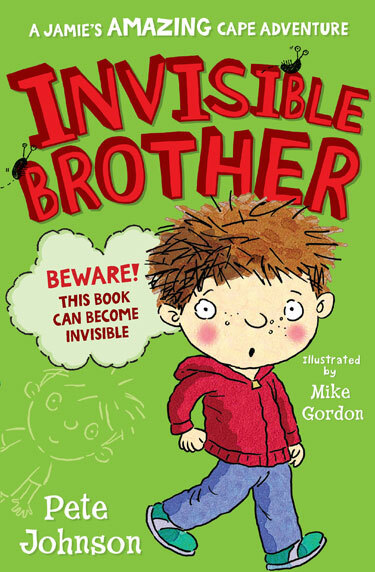 . .
‘This book has been tested on one of my Year 6 Reading Groups – Discovery Club – who are all able readers stuck in a rut with their reading. This was the first book read by this particular group; so the pressure was on to make it a good one. The club members were not disappointed. ‘Most of them could identify with the main character, Louis. They liked the fact that he had adventures they would not necessarily have themselves, such as sneaking off to go to auditions. 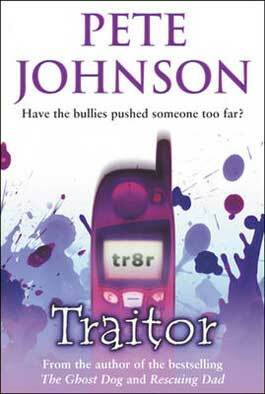 ‘TRAITOR’ is also extremely popular in secondary schools. Recommended by Chicken and Frog Book Club, Essex. ‘The Ghost Dog is amazing. My favourite book so far. My favourite bit is Blood fingers. YES, THE RUMOURS ARE TRUE: ‘LOUIS THE LAUGH’ IS BACK AT LAST IN . . .
What happens in this book? Well it is definitely the most action-packed yet. For a start, Louis’s parents swap roles. So now Dad is at home all day. And soon he’s cooking meals no one wants to eat (Louis would rather eat his brother’s bogies) And Dad even gives Louis his own duster, so he can clean his bedroom himself. Louis is outraged. Cleaning is what parents do. Louis is far too busy. And that’s just the start. It’s not long before there is total chaos. Louis and his brother quickly decide ‘Dads are just not meant to be Mums.’ Or are they? And then there is the moment when he appears on TV and something TRULY, YUKKY happens … I’ve never written a more disgusting scene or I hope, a funnier one. I’ll admit I’m really excited about ‘MY PARENTS ARE DRIVING ME CRAZY,’ but more importantly, so are my translation publishers. In fact, Six top publishers have ALREADY snapped up the rights, including arsEdition in Germany (cover pictured, right) and Gallimard in France. It will be published by Award Publications in Britain in September. Look out for EXCLUSIVE EXTRACTS, on this website from ‘MY PARENTS ARE DRIVING ME CRAZY.’ I will answer all your questions about the new Louis book too. So get writing. I can’t wait to find out what you think of the latest Louis book. But meanwhile as Louis himself would say, SMILE ON. 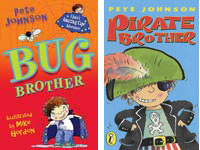 ‘PIRATE BROTHER’ AND ‘BUG BROTHER’ - TWO OF PETE’S BEST-LOVED BOOKS - ARE BACK! The adventures of Jamie and his magic cape have thrilled and amused children all over the world. 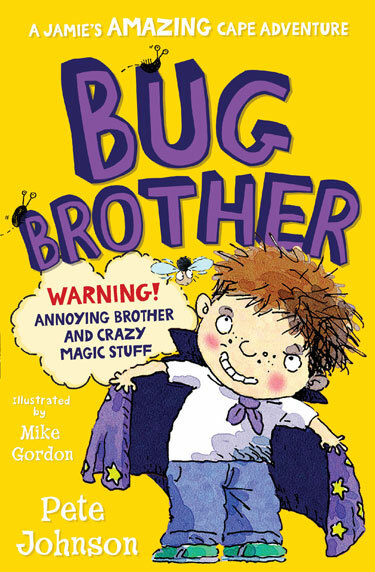 Now ‘Bug Brother,’ in which Jamie turns his very annoying younger brother into a very annoying insect, and can’t turn him back – and ‘Pirate Brother,’ where Jamie magics Brave Bill, the boy pirate, out of a story and into his real life return in brilliant new editions. 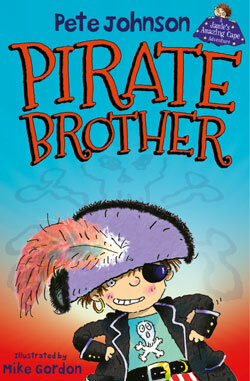 PIRATE BROTHER and BUG BROTHER are published by CATNIP on May 14th. 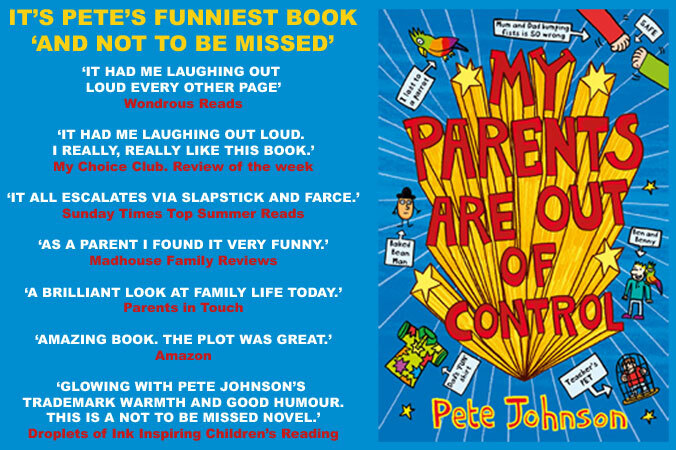 ‘MY PARENTS ARE OUT OF CONTROL’ has been picked for more shortlists and Best of the Year selections than any other book Pete has written. 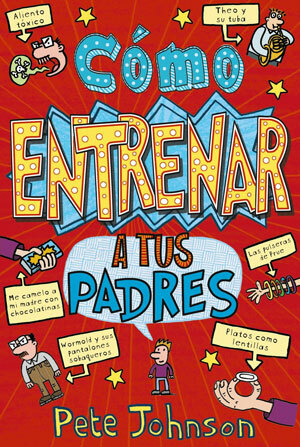 ‘HOW TO TRAIN YOUR PARENTS,’ ONE OF THE ONLINE BOOKS THAT CAN BE ACCESSED FREELY FOR TWO MONTHS. ‘Read for My School’ is a completely free reading competition, open to pupils in Primary (Years 3-6) and Secondary Schools (Years 7-8) across England. The fantastic target is for over one million books to be read by pupils between 19th January and 20th March. ‘Read for My School,’ offers a shortlist of ‘the best fiction and non fiction,’ in eight different categories. These books can be accessed freely by every child in the participating schools, either when they’re at school or at home. 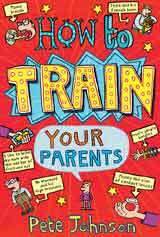 ‘HOW TO TRAIN YOUR PARENTS’ is in the Humour LAUGH OUT LOUD category, which in the past has proved to be the most popular category of all. PETE says: ‘Read for My School.’ is fun and exciting. It inspires you to read as much as you can and find your own special books and authors. Brilliant! ‘The books I discovered when I was at school remain friends now. Only last Christmas I re-read ‘When Marnie Was There,’ by Joan G Robinson. And do you know what, it was even better than I remembered. CLASS 6GW tweeting about the things that interest us. 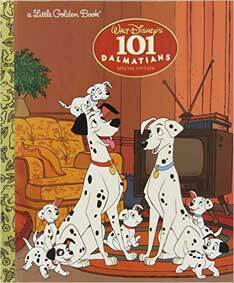 ENFIELD LIBRARIES release their lists of the TOP ISSUED BOOKS for 2014. 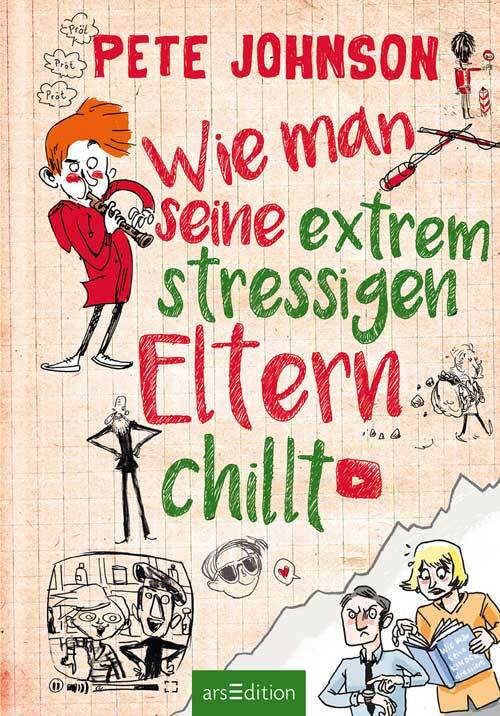 And ‘MY PARENTS ARE OUT OF CONTROL’ is one of their TOP TEN MOST ISSUED CHILDREN’S FICTION BOOKS. Other authors on the list include Philip Reeve, James Patterson and Kes Gray. ‘MY PARENTS ARE OUT OF CONTROL’ is having an exciting time. It has just been shortlisted for two top awards – HOUNSLOW LIBRARIES BOOKBUSTERS AWARD and THE ENFIELD CHILDREN’S BOOK AWARD. It has also just won a prize at the Sheffield Book Award: Commended in the BEST SHORTER/LONGER novel of the year. ‘RESCUING DAD’ IS BACK IN PRINT!! STOP PRESS. The award-winning ‘THE CREEPER’ is back in print on November 27th. You’ve heard of the X FACTOR. Now, even more excitingly comes the B FACTOR. This is a new dynamic scheme launching in Chippenham to create genuine excitement about books and promote reading for pleasure. Then they will adapt the books into five-minute performance pieces using drama, film, music, dance or any combination of these. The groups will also attend a boot camp (more echoes of the X Factor) Here they will be coached by performers in drama, film and music. And then come the live finals on December 9th in Chippenham. And Pete will be the guest author, firstly, leading a gala event at Chippenham Library. And then at the finals Pete will introduce ‘HOW TO TRAIN YOUR PARENTS’ and meet the cast. 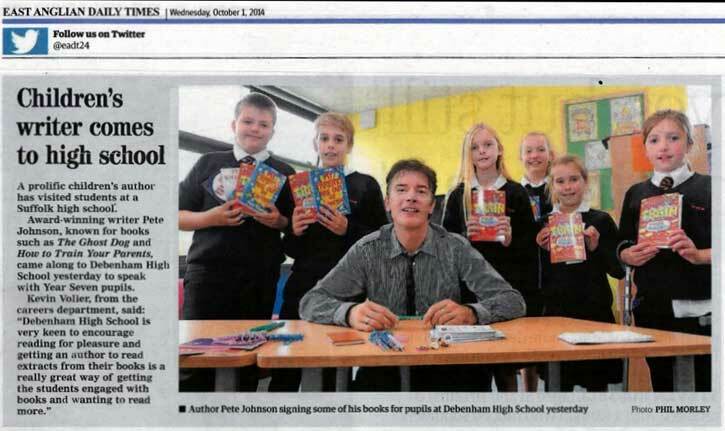 Pete ‘thoroughly enjoyed’ his recent visit to Debenham High School, Stowmarket, Suffolk. But what did the pupils think? Here are their lively views . 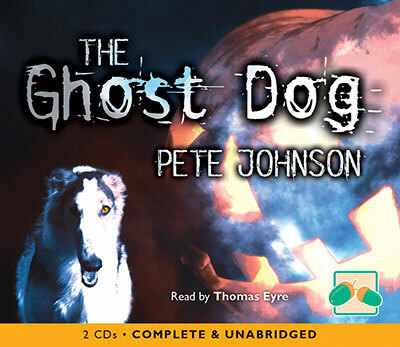 . .
Every autumn, not long before Halloween, Year Seven at Edwinstree Middle School get inspired to write spooky tales by reading ‘THE GHOST DOG’ and inviting Pete to talk about his books to Year Seven – and give them some special writing tips. 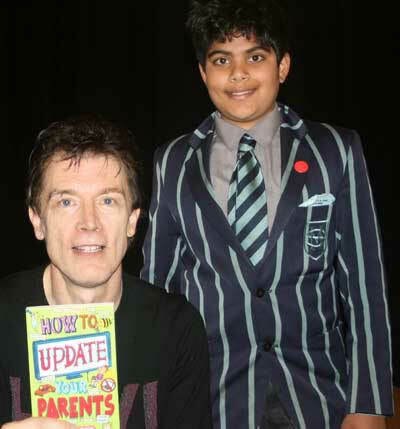 Click the photo on the right to read Lizzie and Annabel’s review of Pete’s event at Teddington School. 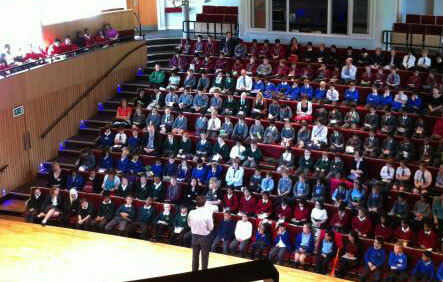 Pictured right: Pete talks to pupils from twenty schools in Birmingham. That’s why this autumn is Pete’s busiest – events begin as early as September 10th with a local event in St Albans, at Mandeville Primary School. 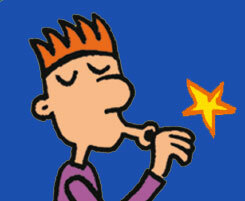 Then Pete returns to Edwinstree Middle School for the eighth time! Every year - Year Seven pupils read ‘THE GHOST DOG’ as a stimulant for writing spooky stories. 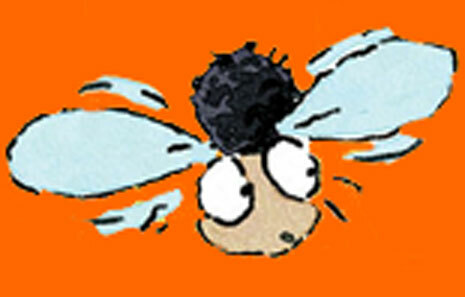 Click here … if you would like Pete to visit your school or library. Without even opening the book what do you think ‘HOW TO TRAIN YOUR PARENTS’ will be about, based simply on the cover and title? Compare your ideas with the rest of the group. How similar are people’s opinions? What is your first opinion of Louis? From the start, Louis is compared to Theo. Louis describes Theo as ‘a wet weed.’ What do you think of him? Look at (p.12) Theo writes down both their marks. What does tell us about him? First visit to Theo’s house (p14-16). On the wall is a chart showing all Theo and Libby’s out of school activities (p15) How would you feel if your parents organised your life like this? Louis’s parents start to change. Look at, for example, p.50,52,56, ‘My bedroom is turning into a sweat shop. Are you completely on Louis’s side? Are his parents partly right? ‘Do you know what I’m suffering from? Parent fatigue. I keep telling myself it’s just a phase they’re going through. They’ve been led astray by our neighbours and got into bad ways. What do you think Louis’s parents would say to this? Does it change as the book goes on? How would you compare her character to Louis? 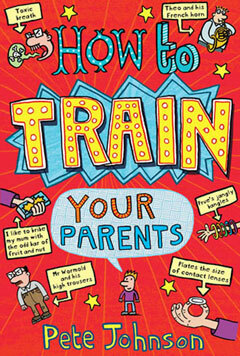 ‘How to Train Your Parents’ is hailed as an extremely funny book. Which scenes did you find the funniest? Would you pick that as the funniest moment? The four rules (p113-116) of parent training. Maybe compile your own list. Would you like Louis to join your school? Do you think you would like him as a friend? Write Louis’s diary detailing his first day at your school. What is your first impression of Louis? Is he someone you would like as a friend? Why do you think Louis’s dad isn’t so keen? Why do you think his dad wanted to do this? Was Louis right to teach him? 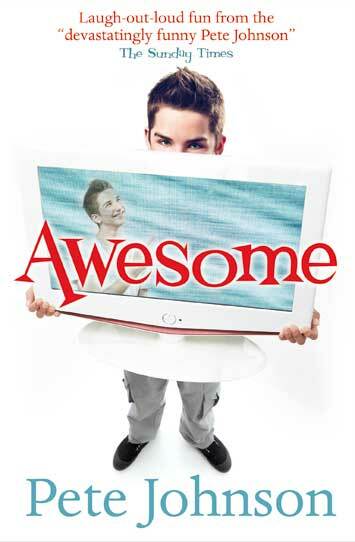 What do you think of ‘Kids with Attitude?’ (p.106-114) Would you ever go on a show like that? 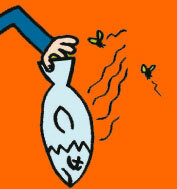 Edgar said the show ‘plumbed new depths of nastiness.’ Would you agree with Edgar? Some people are worried TV talent shows put too much pressure on children to perform well. What do you think? What do you think is the most embarrassing thing Louis’s parents do? Might it be when they dance in public, for instance? (p.137-138) or when they try and ‘friend’ Louis on Facebook (p.143-144) or when Louis’s dad buys a baseball cap? (p.155-156) Or maybe you can think of other examples. What is your opinion of Edgar? Did it change as the book went on? 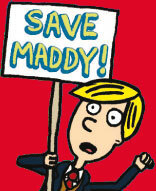 Why do you think Maddy like him? Louis’s Nan and Granddad: How are they different from Louis’s parents? What is their reaction to the baseball cap (p.163-164) Were they right to interfere? The ending of the book. Was Dad’s news a shock? (p.230-234). When Louis says right at the end of the book. ‘The thing is, Dad, really you are in fact cool (p.234) What does he mean? Would you agree? One reviewer described ‘My Parents are out of Control,’ as ‘the funniest kids books I’ve read in ages.’ (Jenny Davies, Wondrous Reads.) Which scenes did you find the funniest? FANGTASTIC NEWS: THE SCARIEST, SPOOKIEST VAMPIRE BOOK OF ALL IS HERE . . .
Pete answers your questions about this eagerly awaited book. I’M REALLY PLEASED THERE IS ANOTHER VAMPIRE BOOK. BUT WASN’T ‘THE VAMPIRE FIGHTERS’ SUPPOSED TO BE THE LAST ONE? Yes it was. Three Vampire books were all I’d planned to write. But then I had a fantastic idea for a stand-alone book. And it wouldn’t let me alone. I even dreamt about it. WHAT IS THE FANTASTIC IDEA? Well, all three of the earlier books were narrated by Marcus, the highly reluctant half-vampire. We only ever see the other main character Tallulah – the vampire-mad human who comes close to guessing his secret – through Marcus’s eyes. But this time Marcus can’t tell us the story at first, because following an accident, all memory of the recent past – including his transformation into a half-vampire – has been wiped from his memory. Sinister things start happening though and only Tallulah – at first – can save the day. I’M THRILLED TALLULAH IS LEADING THE STORY AS SHE IS MY FAVOURITE CHARACTER. A number of people say that. So this time you see Tallulah in a whole new way. I’ve really enjoyed letting her narrate the first part of the story. She can’t narrate the last part though. That would be telling! But it’s a really shocking reason. WHY DO YOU THINK THE VAMPIRE BOOKS HAVE BEEN SO POPULAR? they’ve been in other countries, like Germany and Korea. DO YOU HAVE A FAVOURITE VAMPIRE BOOK? I’m especially keen on ‘The Vampire Hunters.’ I think the scene in which Marcus has a blood craving is one of the funniest I’ve ever written. But overall I think my favourite is ‘THE VAMPIRE BEWITCHED.’ It is certainly the scariest and I believe the most gripping. With special thanks to the pupils of Wreake Valley Academy, Siston, Leicestershire. Keep the questions – and comments about ‘The Vampire Bewitched’ coming. Published in the U.K. on June 6th 2014. The three earlier Vampire books are . 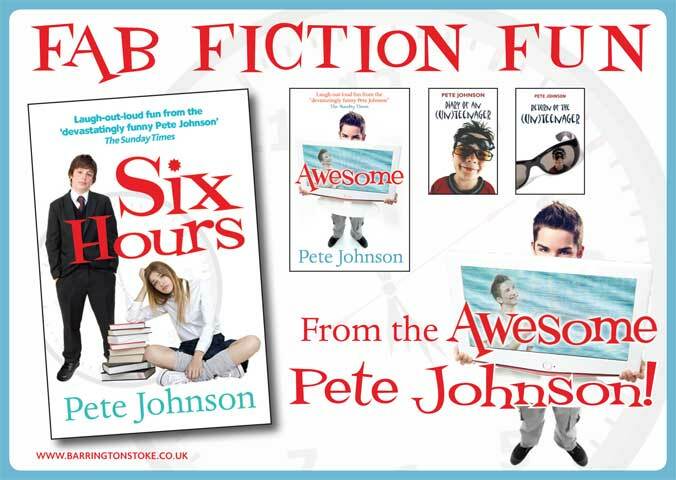 . .
"IN ‘SIX HOURS’ PETE JOHNSON BRILLIANTLY CAPTURES A MOMENT IN TWO TEENAGERS’ LIVES AS HE GETS UNDER THE SKIN OF WHAT PRESSURES THEY ARE UNDER"
Have you ever wanted to run away – just for one day? That’s what Lara and Dominic do in Pete’s new comedy-drama ‘SIX HOURS’. Dominic has never done anything wrong in his life. Lara is the school rebel. Together they escape from school for six hours. Six hours they will never forget. Pete says, "It's a comedy-clash about two very different personalities, who discover they have more in common than they could ever have imagined. But it is also about teen pressure, which I think has never been greater. Pressure at school – but also pressure from social media. "I really liked both Dominic and Lara and I hope readers will too. "I'm thrilled too that it is another Barrington Stoke book, who have published some of my best-loved books, including, of course, 'The (Un)Teenager…' books, about Spencer, the thirteen year old, determined he will never turn into a teenager." PETE’S BEST-SELLING BARRINGTON STOKE BOOKS INCLUDE . . .
"Looking for something to entice a reluctant reader? This is the book to choose." WINNER OF THE BRAUNSTONE BOOK OF THE YEAR AWARD. 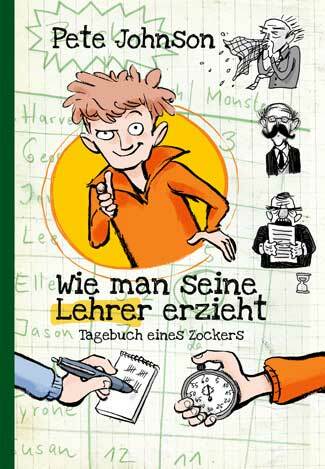 "My son has dyslexia and this was a great, quick read to reignite his interest in reading." MEET PETE . . .
A gala event at OSSETT ACADEMY AND SIXTH FORM COLLEGE IN WAKEFIELD, where ‘MY PARENTS ARE OUT OF CONTROL’ has been shortlisted for the Riveting Reads Book Award 2014. KING’S PREP SCHOOL IN ROCHESTER, where Pete will be discussing his award-winning THE GHOST DOG at an ARTS FESTIVAL on the theme of Dreams. 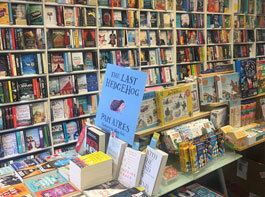 The wonderful independent bookshop, THE CHICKEN AND FROG BOOKSHOP in Brentwood, Essex. And returning to TEDDINGTON SCHOOL for their Super Book Festival. If you would like Pete to visit your school/library. LATEST LOUIS NEWS . . . In our school library it’s all about ‘Diary of a Wimpy Kid’ series. 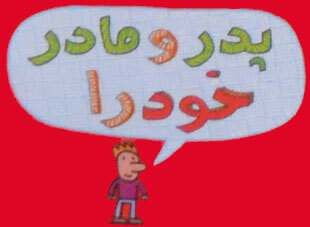 Children love the humour, the readability and quirky illustrations. Can you recommend any books that have these features that we can move the children on to? 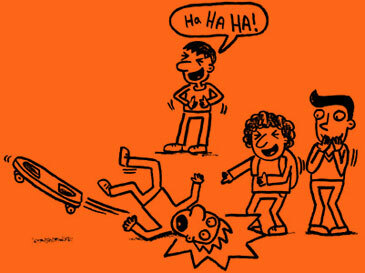 TRUST ME I’M A TROUBLEMAKER,’ by PETE JOHNSON. 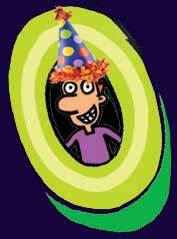 This writer specialises in humorous novels for 8-12 years old. The first two are written in the first person diary entries. The third is a dual narrative – all highly readable and engaging. 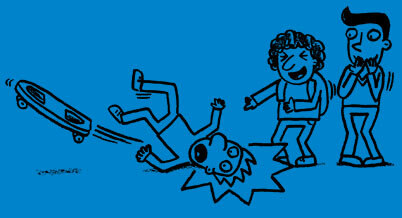 Like Wimpy Kid books these stories feature, tiresome parents, tricky teachers, good friends, and mini-disasters that resolve happily. Pete says, ‘I had a great World Book Day at the first Worcestershire Book Award, organised by the wonderful School Library Service. 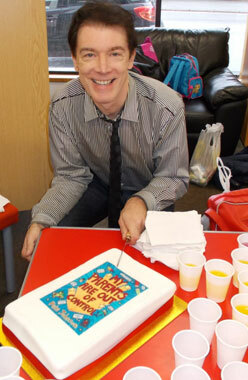 Here I am with the special ‘MY PARENTS ARE OUT OF CONTROL’ cake, which of course, was absolutely delicious. It’s always exciting to be in at the start of something special. "THE FUNNIEST BOOK I HAVE READ IN MY LIFE ." 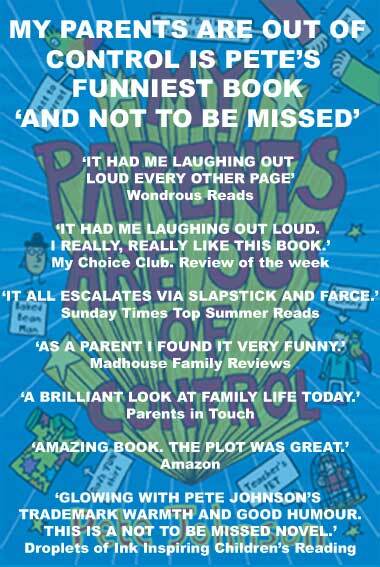 LATEST REVIEWS OF ‘MY PARENTS ARE OUT OF CONTROL’ . . .
"I gave this book a five star rating because it was very funny and had a good story to it. I would recommend the book to anyone who has a good sense of humour as I think it’s fair to say, it is the funniest book I have read in my life." "My Parents Are Out of Control is a very good book. Funny and exciting on every page. It is absolutely the funniest book I have read. It is hilarious and I would recommend the book to absolutely everyone." 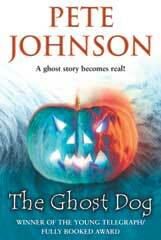 ‘THE GHOST DOG’: "A TRULY HORRIFYING TALE"
"The Ghost Dog is a truly horrifying tale which plays right to the heart of children’s fears. Yes it’s scary but in a good way, the way that makes you hide behind the sofa when Dr Who is coming on – but still keeps you hooked. "Enjoy being scared with this gripping thriller from a maestro in children’s literature." 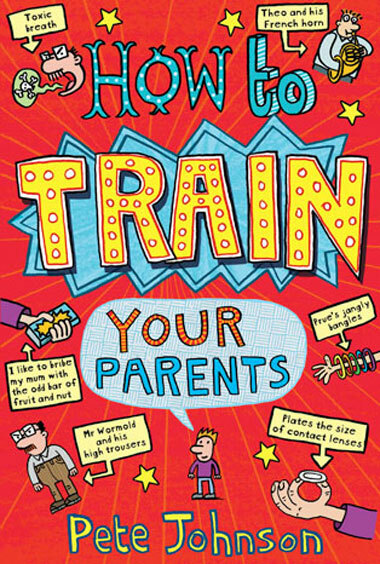 Southampton Discovery Club write: ‘Following the brilliant HOW TO TRAIN YOUR PARENTS our Year Six Group booktesters (10/11 year olds) could not wait to get their hands on the sequel – MY PARENTS ARE OUT OF CONTROL. Here are some of their comments . . .
to read more of the brilliant Discovery Club’s comments about MY PARENTS ARE OUT OF CONTROL at the Waterstone's website (click "reviews"). to download Book Group Notes on MY PARENTS ARE OUT OF CONTROL. 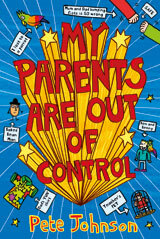 ‘My Parents Are Out of Control’ has also been shortlisted for The Worcestershire Children’s Book Award Key Stage Two. And for The Sheffield Children’s Book Award, which is one of the largest Local Authority Award Schemes in the country, involving over five thousand local children. For 3-6 ‘The Slightly Annoying Elephants’ by David Walliams. "This is a real laugh out loud story, well written and thoroughly enjoyable." to read a great review from Forge Valley Community School, Sheffield, on 'MY PARENTS ARE OUT OF CONTROL' launch. 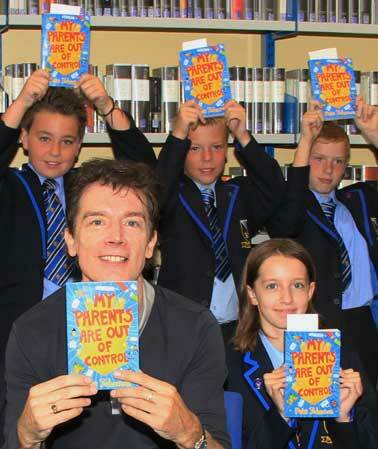 to read a review of ‘MY PARENTS ARE OUT OF CONTROL’ launch with exclusive pictures and comments from the brilliant Year 5 Everest Class, Sheffield. THE TWO HOUR BOOK-SIGNING FOLLOWING THE LAUNCH FOR ‘MY PARENTS ARE OUT OF CONTROL,’ AT THE CRUCIBLE THEATRE, SHEFFIELD. 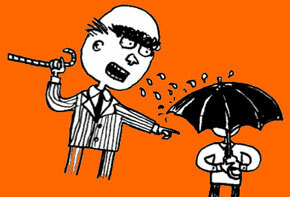 ‘MY PARENTS ARE OUT OF CONTROL’ is one of six titles shortlisted for the Roald Dahl Funny Prize. In the afternoon Pete went on to ST, MARY’S SCHOOL where he spoke to all the Year Five and Six pupils. ‘I was especially impressed by the pupils’ insightful and original questions. They also knew so much about my books. One girl told me she had read, ‘TRUST ME I’M A TROUBLEMAKER’ five times. Pete’s books have proved the way into reading for many young people inspiring one grateful parent to declare recently on Amazon. ‘This household loves Pete Johnson.’ But Pete has written over FORTY books. So what are PETE’S TOP TEN BOOKS? Here’s Part One of your choices and a big thank you to everyone for their selections. 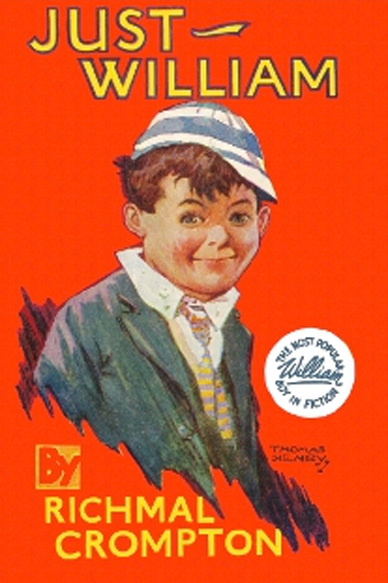 Featuring one of Pete’s best-loved characters, Louis The Laugh. they’re talking to me. And I could even tolerate that if they weren’t talking to me about history, algebra, or world affairs. They’re always trying to slip me something educational. 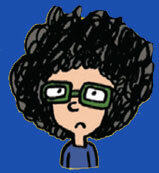 Featuring another favourite character Spencer, the boy who refuses to turn into a teenager. Book Club notes available from Barrington Stoke. Hooray, ‘Louis the Laugh’ is back! ‘I really liked this book … the writing was so realistic that I would not change anything at all.’ Neon Mimi, The Guardian, Children’s Books. ‘We were all surging outside towards the car park when a voice shouted out of the darkness. ‘Yo everyone, hope you had a wicked time. But I’m looking for my blood. Is he here?’ Instantly an eerie silence descended on everyone – although if you’d listened really hard you could have heard my skin crawl. Everyone gaped open-mouthed at this middle-aged man in brand new trousers capering about in front of them. I didn’t answer. I couldn’t. I’d just been shocked out of my brain. Out of the darkness it came floating towards me. It had evil, red eyes. Blood poured out of its mouth. It was the ugliest, most horrible thing I had ever seen. And I’d brought it to life. In the middle of the night they came for me. The first time I only heard them. The next night I saw them too. I looked into the darkness and there they were: THE FRIGHTENERS. And on: Love Reading website. On Saturday morning they woke me up at a quarter past seven. Their text message was short and not at all sweet. PAY UP ON MONDAY OR ELSE. After seeing that I couldn’t stop shaking. In the end I put the blankets over my head and curled up tightly into a ball. Oh how I hated their messages. Hated them, hated them. HATED THEM. The shivery tale with the unguessable ending. Way up in the sky I spotted this really bright star. I didn’t think I’d ever seen a star glow and shine like this one. ‘Look at that,’ I cried. But Sam was already looking at it. That’s when it began to move. The award-winning book club favourite. ‘I didn’t mean,’ I began. But I couldn’t say anymore as Jake had rushed at me and sunk his fist into my stomach. I pitched forward, gasping for breath. AND WHAT IS THE TENTH BOOK? Will it be one of the award-winning comedies? 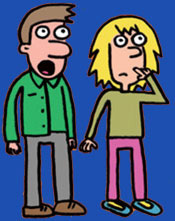 The much loved ‘RESCUING DAD’ OR …..
IT’S UP TO YOU – Result to be announced at the beginning of November. WHAT WOULD YOU DO IF YOU WERE MISTAKEN FOR A TOP TV STAR? 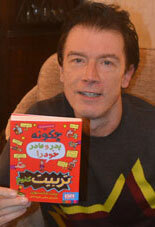 ‘TRAITOR’ is Pete’s most discussed book in schools and libraries – and not just in the UK. Recently a whole class in Canada wrote to Pete about ‘Traitor.’ Here are some of their comments. Pete especially enjoys talking about reading for pleasure. 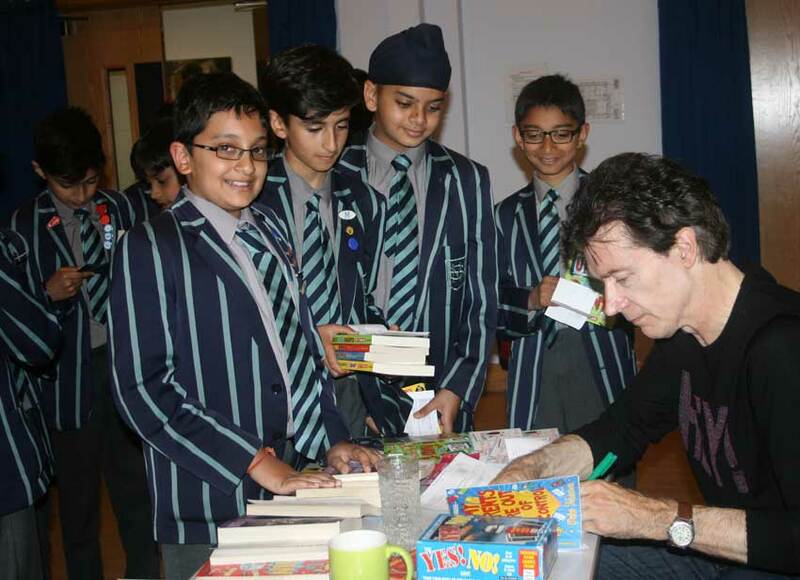 A highlight of last year was his involvement in a special reading for pleasure day at Reading University. So he is delighted to have been invited to speak on this topic at a one day NUT Conference on April 24th. Click here … to read Pete’s blog: WHAT READING FOR PLEASURE MEANS TO ME. It was just one of the highlights in Pete’s busiest year ever. Click here … if you would like Pete to visit your school or library in 2013. Pete is based in Hertfordshire but travels all over the country. His lively, interactive talks have earned special praise. He also offers Creative Writing Workshops – including much-requested Ghost Story telling workshops. Pete works with both primary and secondary school pupils. 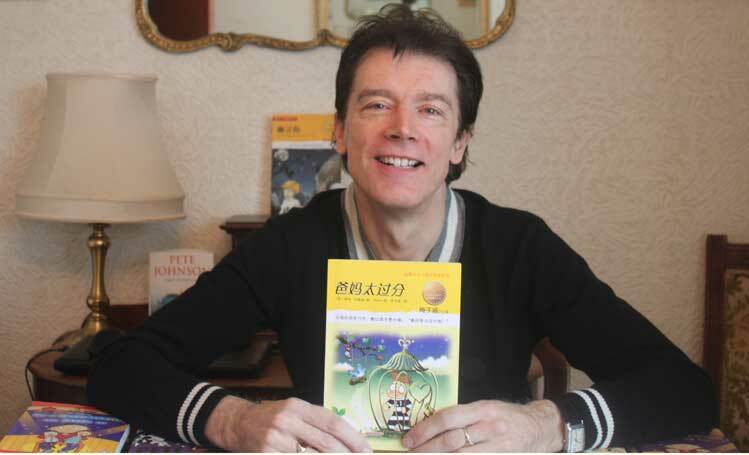 ‘HOW TO TRAIN YOUR PARENTS’ is one of nine titles Pete has published in China. The next title to be published there will be ‘MY PARENTS ARE OUT OF CONTROL.’ To celebrate Pete’s success in China he is making a short video for his readers in China – more details soon. YOUNG patients trying to keep up with their studies were treated to a visit from top children’s author Pete Johnson. 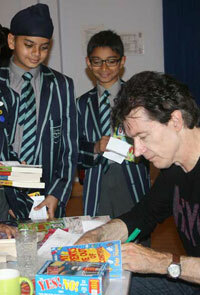 The writer, whose work has sold more than two million copies, spent the day with students at the Children’s Hospital School in Leicester. Pete is known for titles such as How to Train Your Parents, Rescuing Dad and The Ghost Dog. He talked about what it is like to be a writer and about his Vampire trilogy, which is being studied by the children who are too ill to attend school. 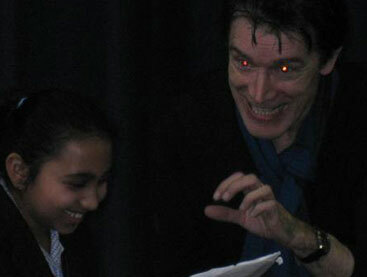 THE VAMPIRE FIGHTERS TOUR: One of the highlights was a superb event at Farringtons School, Chislehurst. The cutting above comes courtesy of The Bromley Times. Pete meets the brilliant pupils and staff from Fairlight School, who have been studying The Vampire Blog as part of the ADOPT AN AUTHOR scheme in Brighton. 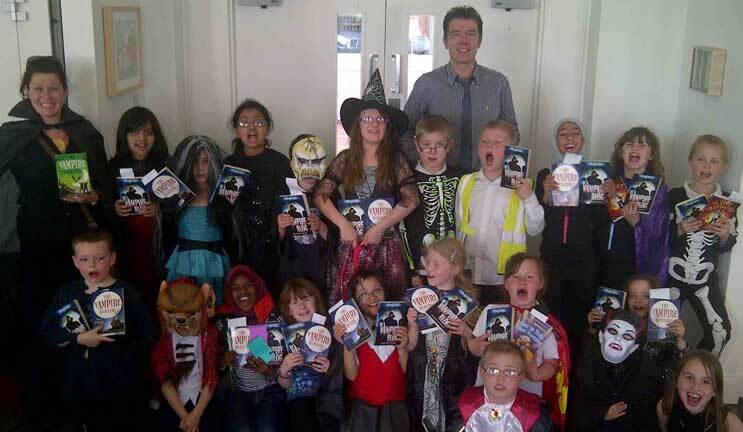 The Vampire Blog inspired the pupils to write some superb stories – and meet Pete in monster costumes! "I love Pete Johnson’s books – they’re so hilarious. How to Get Famous is 100% guaranteed to make you LOL. " 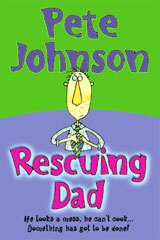 "Pete Johnson is one of my favourite children’s authors. The TV Time Travellers is an excellent way of introducing the genre of history as it contains WW2 evacuation with reality television. My big recommendation for him though is . . .
" . . . an excellent read for Wimpy Kids fans and highly rated by reading groups." "If you like horror or scary books you’ll adore this book. ‘The Creeper’ is really exciting all the way through. This amazing book kept me on the edge of my seat." HELP! I’M A CLASSROOM GAMBLER ONE OF THE GUARDIAN’S TOP TEN ‘LIBRARY’ BOOKS. The Guardian invites Adam Lancaster, who has just been named - School Librarian of the Year, to pick his top ten favourite books that are set in libraries or have set his library alight. 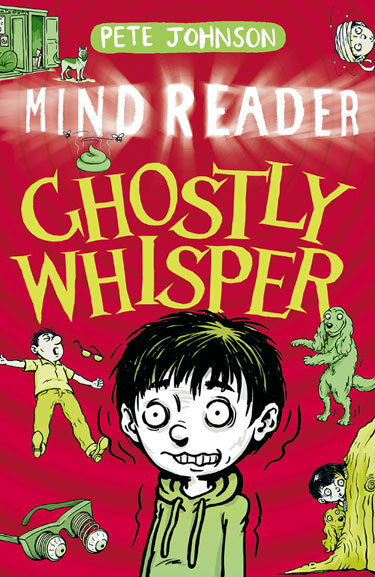 Other books in Adam Lancaster’s list include: ‘Diary of a Wimpy Kid’ by Jeff Kinney: ‘Matilda’ by Roald Dahl and ‘His Dark Materials’ by Philip Pullman. Click here … to read about Help! I’m a Classroom Gambler. Click here … to read Adam Lancaster’s Top Ten ‘Library’ books. "Wow, we finished reading our class novel today, The Ghost Dog. It was absolutely fantastic with some great characters and brilliant dark scenes. My favourite part has to be Blood fingers." 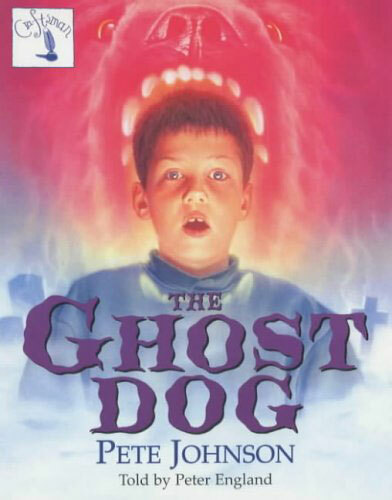 "My class would give this story The Ghost Dog 10 out of 10. 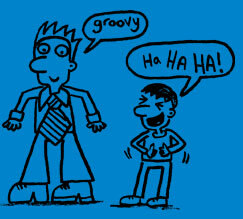 My favourite character is the ghost dog, Billy." 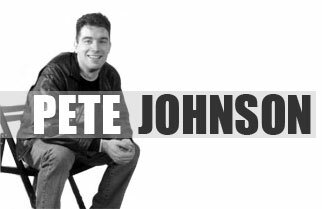 "Pete Johnson creates a wonderful atmosphere. It was scary enough to make me read on with enjoyment. The Ghost Dog is the best book I’ve read in a long time." "The final book in the Vampire trilogy – although complete in itself – is Pete’s most eagerly awaited and talked about book. "The Vampire Fighters is absolutely unputdownable. I loved the series and think The Vampire Fighters is the best of the three." Pete says: "Every author thinks their latest book is their best – and I’m no exception; but I think this is the most exciting story I’ve ever written, with, I hope, some unforgettable twists." ‘THE VAMPIRE HUNTERS’ LAUNCHES IN GERMAN . . . But the title is completely different. 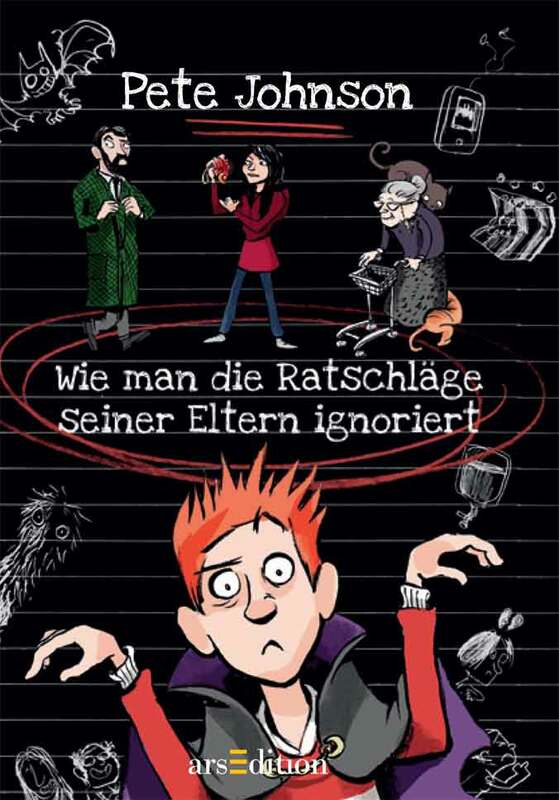 In Germany ‘The Vampire Hunters’ is called ‘How to ignore your Parents' Advice.’ This is because books such as ‘How to Train your Parents,’ have proved especially popular in Germany. 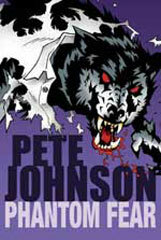 Click here to babbleabout.co.uk … to read the full review and an interview with Pete about The Vampire Trilogy. 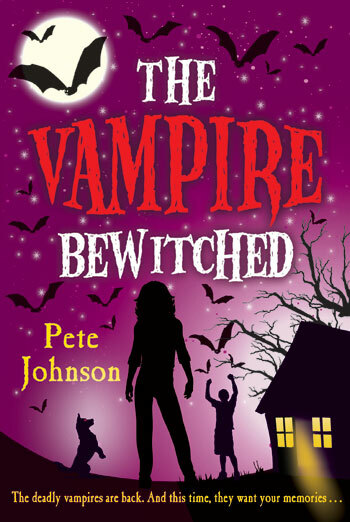 "Vampires, celebrities and comedy – Pete Johnson offers an ideal combination to get students reading." Oxford University Press celebrates Pete, and two of his greatest books: THE VAMPIRE HUNTERS, and HOW TO GET FAMOUS, which are available as ROLLERCOASTERS READERS. These are special editions, supported by extensive teachers’ resources on line, and student focused Reading Guides. "If you think your students have read all there is to know about vampires, they need to think again. Pete Johnson’s novel adds a delicious twist to the genre." "You’re drawn into Toby’s obsession to try and get famous, experiencing his confusion as he waits for his life to catch up with his dreams. It’s so funny in parts that even my eleven year old daughter (who read it with me) laughed out loud." Lynne Johnson, Northern England Secondary Sales Consultant." The first draft was written when I was suffering from gastric flu. I seemed to be ill forever – and the only highlight of my day was when I crawled downstairs to tell the story of a monster who jumped into people’s dreams. 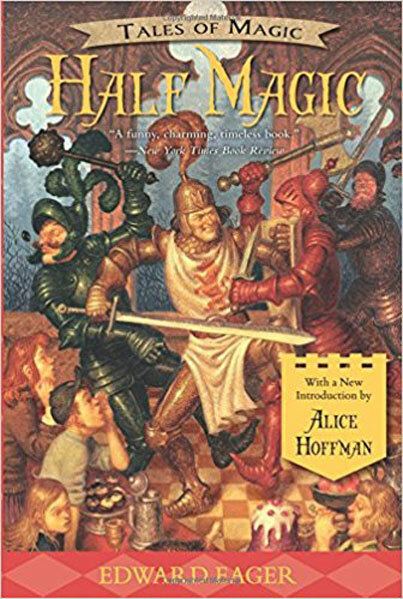 This book was my first big hit and won two prizes. You never quite know why certain books strike a special chord, you’re just so happy when one does. But THE GHOST DOG is really a story about the power of imagination. I especially like the scenes where the children try and tame the monster they’ve created – but it’s nowhere near as easy as they expect. And, despite all their efforts, THE GHOST DOG is still out there, terrorising their dreams . . . I don’t normally write sequels. But readers really wanted me to return to Marcus and Tallulah from THE VAMPIRE BLOG and so I did. But to justify another book I had to raise the stakes. So in this book I introduced a new, deadly vampire who believed human blood (despite its sour taste) would bring it new, undreamt of powers if drunk in sufficient quantities – while draining humans of their life, of course. Marcus is warned these deadly vampires are utterly ruthless. And he discovers just how ruthless, when in a shocking twist he finds out who the deadly vampire is. I’ve never had a character in greater danger . . .
SPOOKIEST CHAPTER – Chapter Twenty Six – when Marcus and Tallulah are confronted by the deadly vampire – without any means of escape. 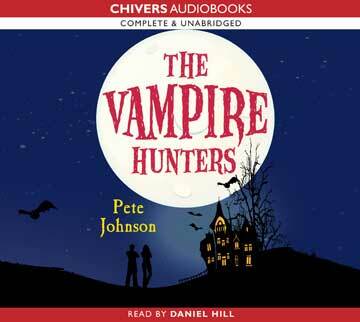 The Vampire Hunters is also available as an e-book and as an unabridged audio from AudioGo. 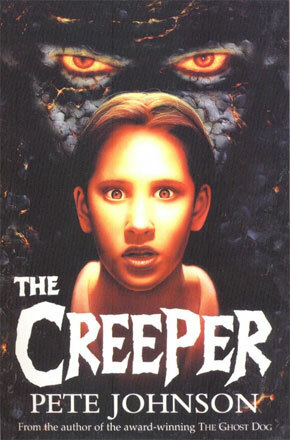 The Creeper is a horrific creature who haunts wrong-doers at night. The first sign that he is nearby is a tapping on your window. And one night (a time when I often work on spooky tales) as I was writing The Creeper I heard a ghostly tapping on my window. Then I smiled and told myself it was only the trees knocking against the window. I carried on writing until I remembered there were no trees outside my window . . . So yes, The Creeper is the story where I actually scared myself. It’s the tale of Lucy, who finds an old tape about "The Creeper." Lucy’s nightmare really begins when the tape starts to come alive in her bedroom. I’ve visited schools and libraries where pupils argue passionately about which tale is scarier – The Ghost Dog or The Creeper. (ISBN 0440863929), as an e-book and as an unabridged audio from AudioGo. Where do ideas come from? Well occasionally a fragment of conversation is enough. So once I heard about a boy who everyone was scared of because he claimed he could put spells on people. That was enough to set my imagination racing. So in The Frighteners, Chloe starts at a new school and is picked on, until a small boy called Aidan comes to her aid. Everyone seems terrified of him and one day Chloe discovers why. If you annoy Aidan, he will slip a picture into your bag. A picture of "The Frighteners" who will stalk you forever . . .
SPOOKIEST CHAPTER – Chapter Ten. When Chloe is haunted by The Frighteners on a trip to the cinema. 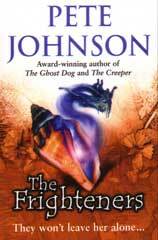 The Frighteners is also available as an e-book and as an unabridged audio from AudioGo. 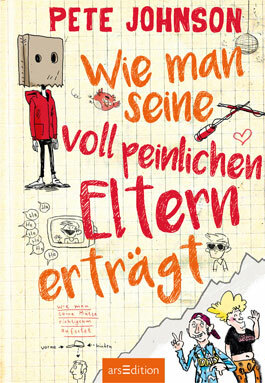 Hi, welch eine Freude zu hören, dass Euch meine Bücher, besonders die lustigen, so viel Spass machen. 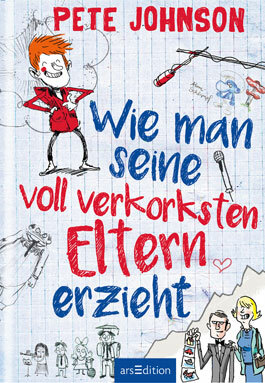 Das ist wirklich tolle Nachricht für mich.
Im August wird mein neues Buch von arsEdition veröffentlicht. Da findet Ihr, so denke ich, eine meiner lustigsten Szenen mit Markus in einer blinden Verabredung im Kino und einer fehlenden Flasche Blut. Ich hoffe, es macht Euch auch wieder viel Spass. Nochmals tausend Dank für Euer Interesse und Euern Beistand. 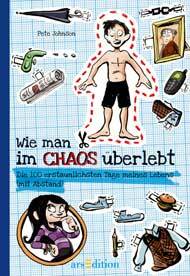 Pete's books have a strong following in Germany and Pete is a big fan of the covers. "They're stylish and vivid and have a great spirit," says Pete. 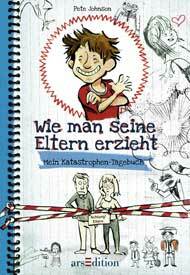 Here are three of Pete’s most popular books in Germany. Can you work out which books they are? As a clue, the first line of each book is given beside the cover. 1. "I think I’ve arrived somewhere weird." 2. "Dear Aunty Prue, I never thought I’d be writing to a problem page." 3. "Three things you never want to hear your parents say." 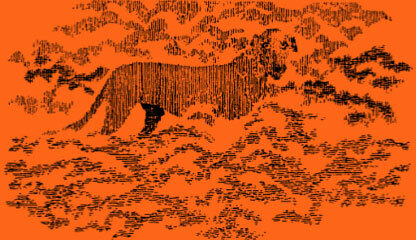 You can find the correct answers at the very bottom of this page. How many did you get right? 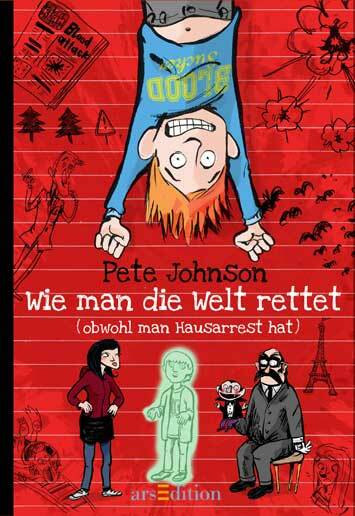 The next Pete Johnson book to be published in Germany is The Vampire Hunters in August. Look out for the cover on this website soon. "It’s a corker," says Pete. 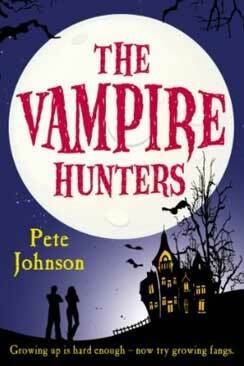 ‘THE VAMPIRE HUNTERS’ has been chosen by OUP as one of the new titles in their acclaimed Rollercoasters series. This will include a reading guide and suggestions for follow-up activities. More details are here at the OUP website. 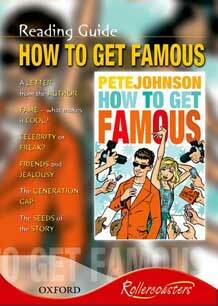 Rollercoasters already publish a special edition of Pete’s ‘HOW TO GET FAMOUS’. Full details here. Having now finished The Vampire trilogy, Pete will be returning to his most popular ever book: ‘HOW TO TRAIN YOUR PARENTS.’ ‘I have had so many requests to write a sequel,’ says Pete. ‘But I’ve never had a good enough idea, until now.’ The sequel will be called; ‘MY PARENTS ARE OUT OF CONTROL.’ More details soon, only on this website. "In my opinion ‘The Vampire Blog’ is one of the best books I have ever read." 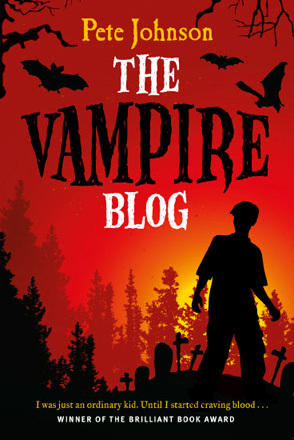 "I really like ‘The Vampire Blog’ – it is very exciting for girls and boys and the format is unusual." First came The Vampire Blog . . .
. . . then came The Vampire Hunters . . .
Spencer is determined he will never turn into a teenager with hilarious results. AND NOW PETE HAS FINISHED THE FINAL BOOK IN THE TRILOGY . . .
Marcus and Tallulah battle the truly terrifying Blood Ghost – and are challenged as never before. SHOCKING TWISTS AND BIG SURPRISES AWAIT THEM – AND YOU – SOON. Published June 2012. CLICK HERE TO READ AN EXCLUSIVE EXTRACT! What happens when Miranda, the rebel of the school, decides to ‘reform’ it’s biggest swot, Archie. Can a teacher ever be your mate? A much talked about comedy. "All I did at lunchtime was turn into a gorilla. And you can’t tell me that’s against schools rules, because it isn’t." Harvey thinks he’s made an incredible, sensational discovery. Has he really found a secret way to stop school ever being boring again? "Maybe I could improve Dad a bit too, sort out his appearance for a start. And teach him how to be a bit more useful about the house. And how to cook a few meals. Up to now all Dad’s cooked in his life is toast. Well, that’s going to have to change." Joe and Claire think they know why Mum chucked Dad out. He’s a mess. Something must be done to transform him into a Dad Mark Two – and fast. CLICK HERE . . . TO READ PETE JOHNSON’S "COMEDY SECRETS – OR WHY WRITING COMEDY SCARES ME." EXCLUSIVE TO THIS WEBSITE. AudioGo present an unabridged audio of ‘bat-tastic’ ‘The Vampire Hunters,’ narrated by Daniel Hill. And a must listen too! WINS - THE BRILLIANT BOOK AWARD. Pete says: "It was such exciting news and it now has a great new cover with the ‘win’ highlighted on the front". 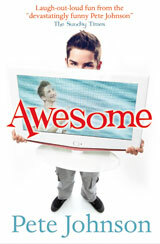 LAUNCHES TO RAVE REVIEWS AND IS MADE BLUE PETER BOOK OF THE MONTH. Pete says: "I’ve never had so many encouraging reviews before. I’m extremely grateful." 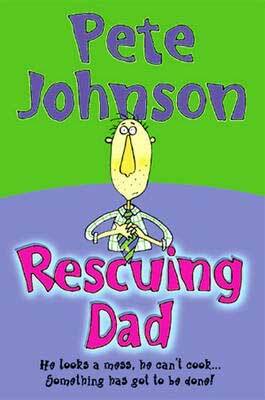 "Pete Johnson is the unsung hero of entertaining writing that delights both the proficient and reluctant reader. He has such a warm, humane sense of ridiculous humour that has you laughing in loud snorts, just as you’re fighting tears of empathy." Pete says: "This quote has followed me everywhere – it’s even been debated at conferences. Many teachers and librarians tell me they are now recommending my books to pupils who are looking to move on from The Wimpy Kid books." And what about all school children reading award-winning HELP I’M A CLASSROOM GAMBLER? ‘A witty subversive’ look at what happens when, to alleviate the boredom of school, a group of pupils start up a gambling club called, ‘The Chancer Syndicate.’ But the bets get bigger and bigger. Pete will be talking about these books at schools around the country. Here he answers some of your questions . . .
(Q) ‘Traitor’ is about someone being bullied on the way home from school, while ‘Avenger’ is about a boy being picked on by a whole class. Did any of this happen to you? PETE: That came about when I was interviewing pupils. One girl told me how she’d been in a girl gang for a while, and loved the feeling of power at first. But when she tried to leave the gang they turned on her. ‘Traitor' is still one of the very few books to feature a girl gang. (Q) I love the part in ‘Traitor’ when they ambush the girl gang with water pistols. Was that based on real life? PETE: No, that was pure imagination. But I did rehearse that scene with my nephews. We all had brilliant fun squirting each other with water pistols for one whole afternoon – and all in the interest of research! PETE: Yes I do. They were especially demanding to write. I had to trawl down deep inside me for some of the scenes. But it’s wonderful when pupils write to me identifying with some of those feelings. One of the best things books can do is show us we’re not on our own. ‘TRAITOR’ is also available as an ebook. Pete tells you all about it . . . The characters Marcus and Tallulah so interested me, I wanted to find out much more about them. 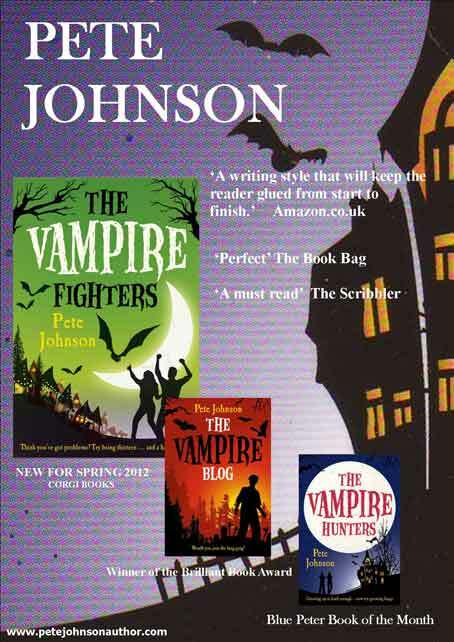 Soon I was imagining all sorts of exciting and spooky situations and wrote ‘The Vampire Hunters’ – perhaps the most warmly received of all my books. And people loved not only the book but ‘The Vampire Hunters’ cover so much, that Random decided to re-design ‘The Vampire Blog’ cover – which I think looks absolutely stunning. Hope you like it too. I have now just finished the third and final Vampire book, ‘The Vampire Fighters,’ which brings the story to a highly dramatic ending. Already I’m missing the characters – and the deadly vampires! 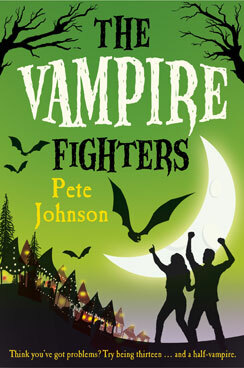 Look out for an exclusive extract from ‘The Vampire Fighters’ and a first peek at its cover here – soon! ‘THE CREEPER’ one of Pete’s spookiest tales, has only been available for a while as part of ‘Ghost Trouble.’ But now, in response to demand from discerning readers, ‘The Creeper’ is back on its own. ‘THE CREEPER’ is also available from AudioGo (unabridged). And from 31st October as an ebook. 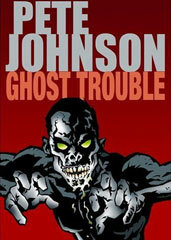 ‘GHOST TROUBLE’ features both ‘The Ghost Dog’ and ‘The Creeper’ in one volume. Want to go back to school LAUGHING? Well read Help! I'm a Classroom Gambler. Harvey thinks school should be more fun. And one day he makes a sensational discovery. He’s found a secret way to stop school ever being boring again . . .
Find out what it is and what happens when Harvey puts his plan into action in Help! I'm a Classroom Gambler. "This was a fantastic break from all the fantasy and angst-y books I usually read. ‘Help! 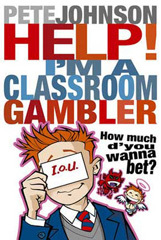 I’m a Classroom Gambler,’ was humorous and witty … everything was just fun. Made me laugh all the way through and I could really get in the character’s shoes. Really cool. Five stars." 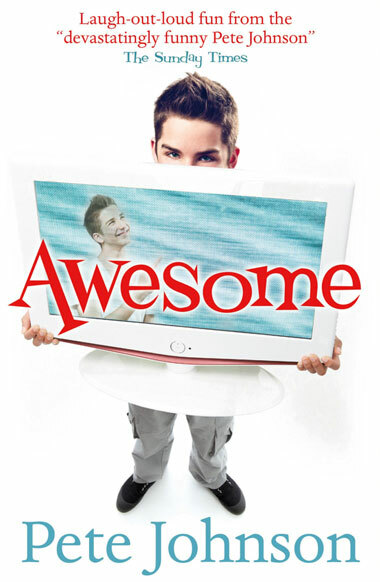 Click here to read more about ‘the really cool’ ‘Help! I’m a Classroom Gambler . . .
HELP! I’M A CLASSROOM GAMBLER is also available as an unabridged audio book from Chivers and as an ebook. 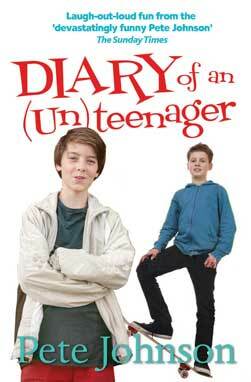 "I gave ‘Diary of an (Un)Teenager’ to my 12 year old dyslexic son who is a reluctant reader. He thought it was fab and asked whether there were any more in the series . 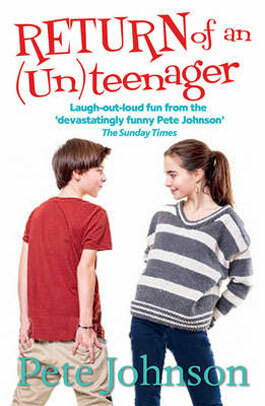 . ."
"Looking for something for someone who’s read the entire Wimpy Kid series then, Return of the (Un)Teenager is the book to choose." "Open the book, read the first sentence and Pete Johnson will hook you right away into the story. A fast read children will love to discover." 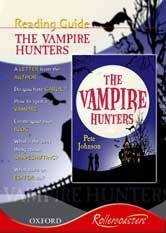 "I cannot recommend The Vampire Hunters highly enough. It is an absolute delight to read and it ticks all the right boxes for its targeted audience: exciting, funny, a bit scary, current. I can only hope that’s not the last we have seen of Marcus. So cross fingers, this series will be a trilogy at least." "One of my favourite parts was when Marcus flitted on his own. Bat-tastic. 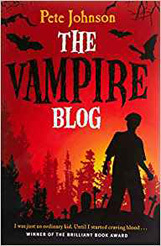 I happily give this vampire book 9/10"
"Spencer, at thirteen is resisting the pressure to leave the familiar, comforting world of childhood behind. Something that is so easy to identify with and yet often hard to admit to. Spencer gives all the doubts and insecurities a voice and in doing so, perhaps offers a refuge to others at the same stage …The book ends on a rewarding and nicely comic note too." 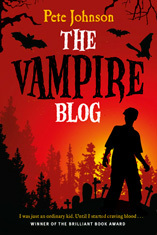 The Vampire Blog has also just been short listed for The Redbridge Children’s Book Award. The eagerly awaited sequel to The Vampire Blog – The Vampire Hunters is published on June 2nd. Click here … to read the Bookbag interview in which Pete gives an exclusive preview of the sequel to The Vampire Blog and find out whether Pete would rather be a vampire or a werewolf! CLICK HERE to read two blood-splattered extracts from The Vampire Blog. Click here … to read more about the awarding-winning AVENGER. Click here … to read Pete’s thoughts on his two anti-bullying books: AVENGER and TRAITOR. 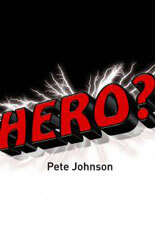 "Pete Johnson is the unsung hero of entertaining writing that delights both the proficient and the reluctant reader. He has such a warm, humane sense of ridiculous humour that has you laughing in loud snorts, just as you’re fighting tears of empathy. 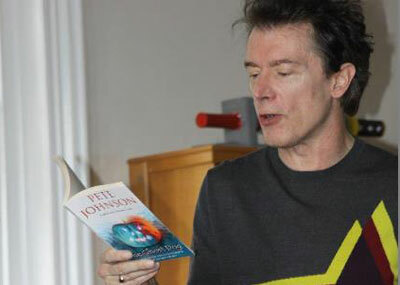 "Many a reading-phobe has become an eager reader after trying one of Pete Johnson’s many books. 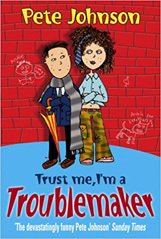 ‘HOW EMBARRASSING IS THAT?’ is a good place to start the pupil who hates reading, while ‘HELP I’M A CLASSROOM GAMBLER and ‘TRUST ME, I’M A TROUBLEMAKER,’ are perfect for those too busy being wriggly to read. 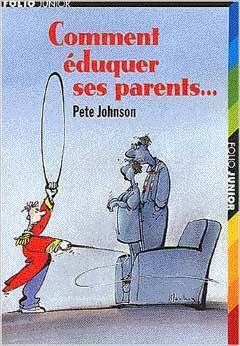 It’s actually all of Pete Johnson’s writing that I urge you to introduce your students to in our quest to promote entertaining reading." 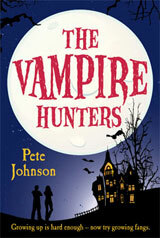 Children’s Reading Partners have just selected The Vampire Hunters as one of their three Key Stage 2 June Spotlight titles. 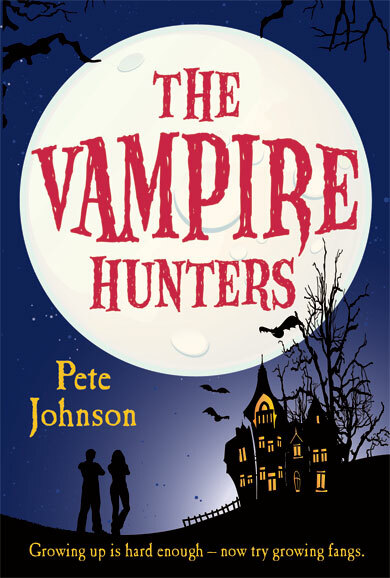 Pete says: ‘All publishers submit titles for this so I’m really excited that The Vampire Hunters, has been chosen.’ Look out for more details about this on The Reading Agency website and Reading Zone. 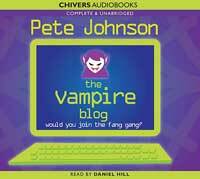 Pete Johnson‘s ‘The Vampire Blog,’ is proving to be one of Pete’s most popular audios. On its launch, actually breaking into the AudioGo Top Ten. Click here for more details on AudioGo. Go to the NEWS section to find out about Pete’s twenty-three titles available on AudioGo. "Reading a novel by Pete Johnson will leave you breathless and have you in stitches. Like many gifted authors, he has the ability to immediately draw you into a book until you find yourself reading at all hours, hardly able to wait for the conclusion. One such book is TRAITOR. As soon as I had read the first few lines I knew I had to continue." Click here … to read more about ‘the anti-bullying classic TRAITOR. Bumper horror containing two of Pete’s prize-winning, eerie tales, The Ghost Dog (also available separately) and The Creeper. Many of Pete’s most popular books are also available on Audiogo, the anti-bullying classic 'TRAITOR.’ ‘The absolutely hilarious’ HOW TO TRAIN YOUR PARENTS, as well as teen favourites such as ‘FAKING IT,’ about a boy who girls like – but only as a friend, and the powerful, highly-acclaimed ‘HERO GAME,’ about a boy who makes a shocking discovery about his grandfather’s past. Click here … to Audiogo now to find out more about these outstanding audios. WHY CAN'T BOYS TELL IF THEY'RE BEING BULLIED? Luke and his sister Sophie have always been deadly enemies. But suddenly his sister needs his help and Luke finds himself fighting the hardest boy in the school – to his total horror! Click here to read the first chapter . . . Shut It! In a protest against his life Ben decides he’s not going to speak for a month – with surprising and very funny results. 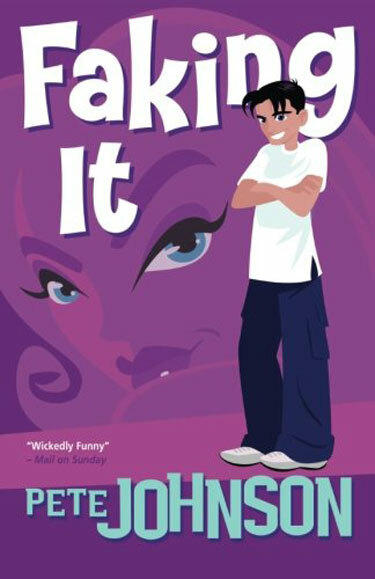 At last, in answer to many readers’ requests, Pete has written a sequel, Return of the (Un)Teenager, in which Spencer goes to a school disco – and experiences Facebook with wickedly, funny results. It will be published in January 2011, but you can have a sneak preview of two extracts from the book here. In the fourth Spook School book: Charlie and Lewis – two ghosts who fly to Earth to solve eerie mysteries are faced with their scariest and smelliest ghost yet! Click here to read two extracts! 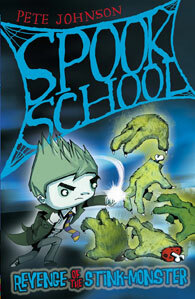 How many Spook School books have you collected? HOW TO GET FAMOUS OUT IN OUP Rollercoaster Edition . . .
Pete’s award winning comedy about fame and celebrity is published in a great new educational edition by OUP (Rollercoaster) As well as the sparkling story this edition includes a special booklet considering why be famous (the rewards and down side) as well as a key analysis of how the book is written and a letter from Pete Johnson introducing some of the book’s themes. THIS WILL PROVIDE A GREAT STIMULUS FOR CLASS DISCUSSIONS ON SOME OF THE MOST TALKED ABOUT TOPICS TODAY. How to Get Famous, the ‘really funny book on the pitfalls of the fame game’ (Writeaway), has won the Sheffield Community Libraries prize for their favourite children’s book. How to Get Famous, described as ‘a thoroughly, good-hearted and entertaining book with lots of humour and witty dialogue,’ (School Librarian) will also be available in a special edition for schools soon (Pub. Oxford University Press) with notes and discussion points. 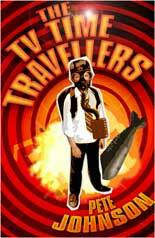 It’s just been announced that The TV Time Travellers has been shortlisted for the Leeds Children’s Book Award. Recently it has also been shortlisted for the East Sussex Book of the Year Award. The TV Time Travellers is proving to be one of Pete’s most popular books. A NEW BARRINGTON STOKE: SHUT IT! Some of Pete’s best-loved stories are published by Barrington Stoke, including the acclaimed comedy, Diary of an (Un)teenager, about a boy who dreads becoming a teenager. (Pete is currently writing a sequel to this one) and The Best Holiday Ever, about a group of teenagers on their first-ever holiday abroad without parents, offering ‘riotous humour and action a-plenty from a master of the comedy genre.’ The perfect holiday read, in fact. Sky Kids have selected The TV Time Travellers as their June Book of the Month. Read more, including an interview with Pete where he chats about reality television, writer’s block, and hating Chemistry here at the Sky Kids website. • Children’s Reading Partners have chosen The TV Time Travellers as their Key Stage 2 title for the June SPOTLIGHTS promotion. This is a promotion to highlight a small selection of titles every month in libraries. The titles have been chosen by The Reading Agency and are the books they felt would have a particular appeal in libraries. • St Philips Church in Leicester is marking their centenary with a special time capsule, which they will be burying on Sunday June 7th. 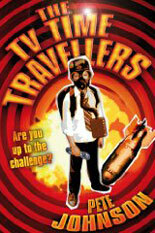 Pete is ‘thrilled’ that the book they have selected for this is The TV Time Travellers. The capsule will not be opened for fifty years. Pete is continuing his ‘Boys into Book,’ events – he has now visited over fifteen different library authorities this year – at Surrey Libraries and Battersea Libraries. He will be visiting schools and libraries in Golders Green, Teddington, Basildon, Rickmansworth, Hockley, South Kensington and Orpington. He will also be presenting the Creative Writing Competition prizes for Tower Hamlets School Library Service. Pete judged the entries which were of a very high standard indeed. The TV Time Travellers, Pete’s new book, has been selected by The Bookseller as a key choice for June. ‘A highly accessible and engaging book. Not to be missed.’ Click here to read the full review. 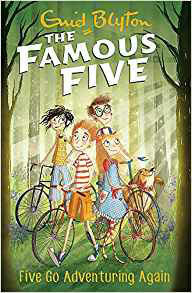 In the book, five children are picked to travel back in time seventy years to the start of World War II and be evacuated, accompanied by TV cameras. How will modern children cope with the rigours of war-time life – not to mention being filmed for a reality show? Some book group fans in Hertfordshire conducted an exclusive interview with Pete about this amazing new book. Click here to read it. 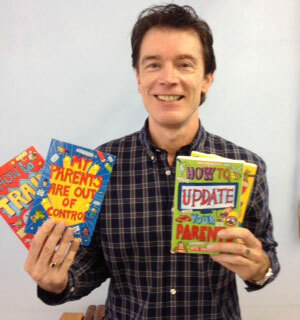 Pete has started an action-packed schedule of events by addressing a conference for English teachers in Telford on ‘Reaching the Reluctant Reader.’ Over the next few weeks he will be visiting schools, libraries and bookshops in Northwood, Bushey, Wolverhampton, Hertford, Hatfield, Fleet, Enfield, Royston, East Croydon and Gillingham. He is also judging a major writing competition for Tower Hamlets and taking part in ‘Adopt an Author’ with a school in Brighton. Later he will meet the pupils at the Brighton Festival. The comedy about two children who are determined to get famous – and hailed by The School Librarian as ‘thoroughly good hearted and entertaining book,’ has been shortlisted for the Leicester Best Book of the Year Award and The Sheffield Children’s Book of the Year Award. Five new titles in 2009 . . .
2008 was a comparatively quiet year for Pete with just the appearance of one major title: ‘How To Get Famous.’ However, 2009 looks like being his busiest ever with the launch of FIVE – yes, FIVE new books and the reissue of an old favourite: ‘Bug Brother,’ in April. The first of Pete’s NEW books, published in June is 'The TV Time Travellers,’ (Corgi Yearling) – five children are picked to travel back in time seventy years to the start of World War II and be evacuated, accompanied by TV cameras. How will modern children cope with the rigours of war-time life – not to mention being filmed for a reality show? STOP PRESS: How To Get Famous has just been shortlisted for the Leicester Best Book Award 2009. The shortlist and the winner is chosen by children. Pete gets 'adopted' . 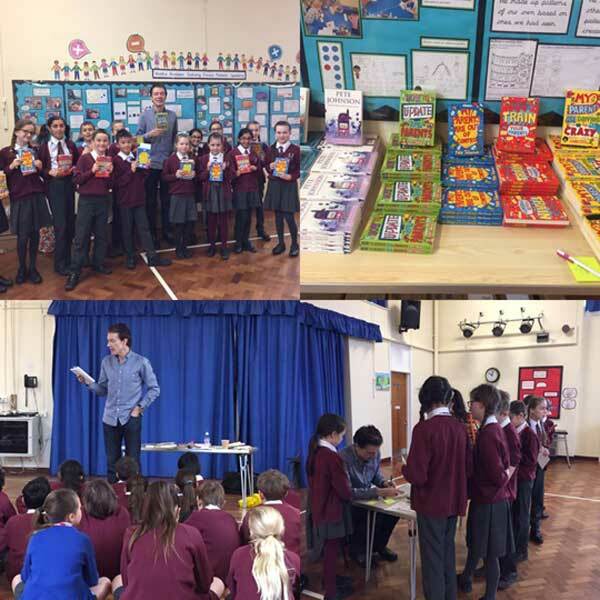 . .
Pete continues his highly successful ‘Boys into Books’ tour into the Spring … he has events with Wirral, Northampton, East Croydon and Kent Libraries. He will also be judging this year’s Tower Hamlets Creative Writing Competition and is being ‘adopted’ by a school in conjunction with Brighton Festival – more details to follow. One of Pete’s best-loved books is ‘BUG BROTHER.’ This is the comic fantasy about a boy, Jamie, who finds a magic cape – and accidentally turns his annoying brother into a bluebottle. This sparkling novel for younger readers has been unavailable for a while, but returns in April 2009 in a super new edition with Catnip. 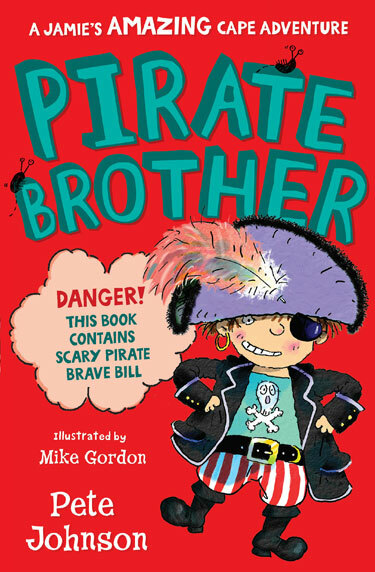 The second book about the magic cape, ‘PIRATE BROTHER’ – in which Jamie conjures up a boy pirate out of a story – is available with Puffin. 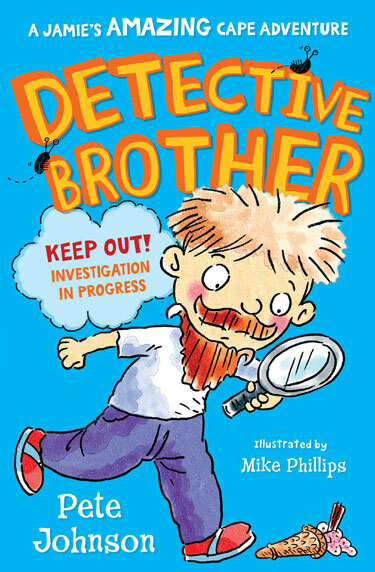 Pete is now working on a third book about Jamie and his magic cape called: ‘INVISIBLE BROTHER,’ which will also be published by Catnip in 2009. Meanwhile, there are plans for a special stage adaptation of ‘BUG BROTHER.’ Keep watching the website for exclusive details. HOW TO GET FAMOUS was also been selected as September Book of the Month by www.teachit.co.uk (Book Group), a brilliant resources site for teachers. 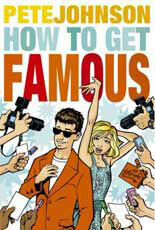 And, HOW TO GET FAMOUS will soon be an eBook, available from Waterstones.com and other online retailers. READ HOW PETE TRIED TO GET FAMOUS – ONLY ON THIS WEBSITE! CLICK HERE! WHICH PETE JOHNSON SHOULD I READ? THE GHOST DOG: the famous spooky tale. HOW TO TRAIN YOUR PARENTS: the laugh out loud comedy. 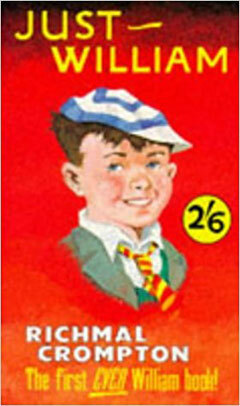 WHICH OF PETE’S BOOKS ARE ESPECIALLY POPULAR WITH BOYS? SIX KEY TITLES . . . 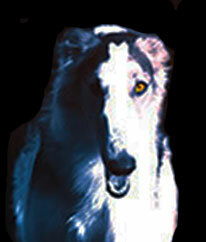 Horror: THE GHOST DOG A terrifying ghost story starts to come true. Horror: THE FRIGHTENERS What terrible power does a mysterious schoolboy possess? 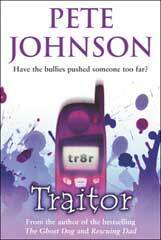 Thriller: TRAITOR A boy finds himself terrorised by a gang – of girls. 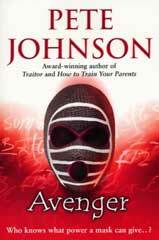 Thriller: AVENGER When the whole school turns against one boy, he asks for help from a ghost! Comedy: RESCUING DAD What happens when you try and do a ‘groundforce’ on your dad? A Dads/Lads favourite. Comedy: HELP! 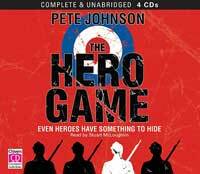 I’M A CLASSROOM GAMBLER Has a schoolboy hero really found a secret way to stop school ever being boring again? The review reads: "Pete Johnson writes very fine books for the young and always seems to be in tune with their thoughts, attitudes and concerns. In this book a mild-seeming new boy claims to have been recruited as a spy and persuades James Bond and Sherlock Holmes fan, Tasha to let him use her house to watch over some neighbours. Parent and child relationships and interaction are lightly handled in the context of the story. And the short chapters make it all very reader- friendly. As well as the unfolding mystery, there’s the writer’s usual observant wit and sparklingly fitting dialogue." How Embarrassing is That is one of the titles picked for The Times Campaign ‘Books for Schools,’ - ‘which aims to provide thousands of free copies of some of the best children’s fiction.’ For more details click here. 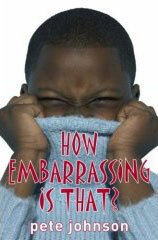 ‘How Embarrassing is That’ is one of Pete’s most popular comedies about a competition to find out who has the most embarrassing parents. The score list includes five points for singing or dancing in public and six points (maximum) for giving you a big kiss or hug anywhere, anytime. The book begins with two words destined to strike fear into any kid. A parent shrieks out ‘Hi Tiddles,’ a dreaded nickname which suddenly all the school hears. The nightmare starts here. If you think writers stay at home all day, think again! Pete kept a diary during World Book Week. Read it here! "THIS IS ONE OF THE FEW TRULY FRIGHTENING CHILDREN’S BOOKS I’VE READ." This is the opening line of a review of Pete Johnson’s horror classic: ‘The Ghost Dog’ on Amazon Customer reviews. The reviewer, A.T. (Rothbury) goes on: ‘Every paragraph is absolutely brimming with juicy, intrigue, with a very moving twist at the end.’ Click here to read more about 'The Ghost Dog'. ‘The Ghost Dog’ is also featured in the book ‘Ghost Trouble.’ This presents both of Pete’s award winning horror tales — ‘The Ghost Dog,’ and ‘The Creeper’ — in one bumper volume. Click here to read more about ‘Ghost Trouble’. At the SHEFFIELD CHILDREN'S BOOK AWARD, 'Help! I'm a Classroom Gambler' was voted the Best Shorter Novel of the Year. 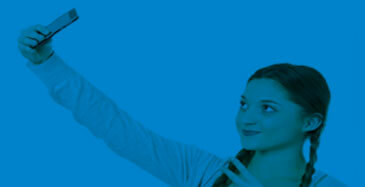 Over 140 schools took part in the judging, with many of them voting online for the first time. 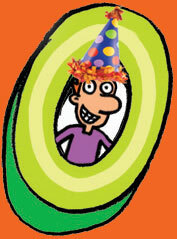 Pete says: "The Sheffield Book Awards are always such a special event, with over 400 children attending. I was thrilled and honoured that they picked 'Help! I'm a Classroom Gambler' as their favourite read of the year." WHICH IS PETE JOHNSON'S GREATEST BOOK?